Brains organize behavior and physiology to optimize the response to threats or opportunities. We dissect how 21% O2, an indicator of surface exposure, reprograms C. elegans' global state, inducing sustained locomotory arousal and altering expression of neuropeptides, metabolic enzymes, and other non-neural genes. The URX O2-sensing neurons drive arousal at 21% O2 by tonically activating the RMG interneurons. Stimulating RMG is sufficient to switch behavioral state. Ablating the ASH, ADL, or ASK sensory neurons connected to RMG by gap junctions does not disrupt arousal. However, disrupting cation currents in these neurons curtails RMG neurosecretion and arousal. RMG signals high O2 by peptidergic secretion. Neuropeptide reporters reveal neural circuit state, as neurosecretion stimulates neuropeptide expression. Neural imaging in unrestrained animals shows that URX and RMG encode O2 concentration rather than behavior, while the activity of downstream interneurons such as AVB and AIY reflect both O2 levels and the behavior being executed. From humans to worms, animals must respond appropriately to environmental challenges to survive. Starving animals must conserve energy while they seek food; animals that encounter a predator must fight or flee. These responses involve the animals re-programming their bodies and behavior, and, in humans, are thought to coincide with feelings or emotions such as ‘hunger’ and ‘fear’. Understanding these states in humans is difficult, but studies of simpler animals may provide some insights. The microscopic worm Caenorhabditis elegans offers a unique advantage to these studies because it has the most precisely described nervous system of any animal. The worm lives in rotting fruit, but it avoids the fruit's surface, perhaps because there is an increased risk of it drying out or being eaten by predators. Microbes that grow within the rotting fruit reduce the oxygen level below the 21% oxygen found in the surrounding air, and so one strategy that C. elegans uses to avoid surface exposure is to continuously monitor the oxygen concentration. If the worm senses that the oxygen level is approaching 21%, which suggests it is nearing the surface, it reverses and turns around. If it cannot find a lower-oxygen environment, the worm switches to continuous rapid movement until it locates such an environment, and adapts its body for surface exposure. Laurent, Soltesz et al. sought to understand the circuit of neurons that controls this switch. Monitoring gene expression in the worms revealed that specific oxygen-sensing neurons help generate the widespread changes that occur in the worm's body. These neurons also control the switch in the worm's behavior. Sensory neurons relay signals to downstream neurons that act on muscles to alter behavior. Neurons typically communicate with other neurons via specific connections; but neurons can also release signaling molecules, which act like ‘wireless’ signals and can affect many other cells. Laurent, Soltesz et al. showed that both kinds of signaling are needed to change the worm's behavior, and suggest that the release of signaling molecules may explain the widespread effects of 21% oxygen on the worm. Laurent, Soltesz et al. then monitored the activity of neurons in freely moving worms, and found that some neurons appear to encode and relay specific sensory information. Other neurons encode the behavior the animal is performing, and yet others can encode both kinds of information. To confirm which neurons control particular behavioral responses, Laurent, Soltesz et al. measured changes in the worm’s behavior after destroying or altering specific cells, or while they used light-based techniques to artificially excite or inhibit specific neurons. At a simple level the worm's response to 21% oxygen resembles the response of a mammal to a dangerous environment: both become more aroused, change how they respond to other sensory cues, and adapt both their bodies and behavior. As such, C. elegans provides a great model to explore at a small and accessible scale how changes in animals' states are generated. Mammals adopt different global states in response to threats or opportunities by coordinated changes in physiology and neurochemistry that optimize and focus their response to the situation at hand (LeDoux, 2012). Hallmarks of such global states include arousal, a reconfiguring of the relative importance given to different sensory cues, and altered physiology due to endocrine feedback (LeDoux, 2012). Examples of global states include those evoked by a potential mate (Pfaff et al., 2008), by predators (Martinez et al., 2008; Motta et al., 2009), or by nutritional state (Atasoy et al., 2012; Sternson et al., 2013). Understanding how global states are encoded in neural circuits is of interest because they may provide insights into subjective behaviors: for example, fear, aggression, and hunger (LeDoux, 2012; Damasio and Carvalho, 2013). The exact nature of global organismic states is poorly understood. A switch in global state is thought to involve recruitment of many brain circuits whose individual activities are dynamically assembled to address the circumstances faced by the animal. A powerful entry point to study circuits orchestrating such states has involved identifying small populations of neurons whose activation or inhibition can evoke features of the states. For example, in mouse, optogenetic activation of neurons in the ventromedial hypothalamus can induce aggressive behavior (Lin et al., 2011), while optogenetic control of basolateral terminals in the amygdala's central nucleus can regulate anxiety-like states (Tye et al., 2011). How these small populations of neurons modulate different areas of the brain, how their functional effects depend on the state of other circuits, and how their activity is itself controlled, are open questions. Invertebrates also adopt different behavioral states, for example, in response to potential mates (Villella and Hall, 2008), predators (Henschel, 1990; Uma and Weiss, 2012), conspecific rivals (Dow and von Schilcher, 1975), and nutritional state (Gaudry and Kristan, 2012). Some of these responses share features of global organismic states in mammals, and may provide insights into how the latter are encoded. A complication in understanding how circuits encode global animal states is that the cues evoking them are often complex. For example, a male Drosophila courting a female fly responds to visual, olfactory, and gustatory cues (Villella and Hall, 2008); in Caenorhabditis elegans, starvation resets many sensory responses, including gustation (Saeki et al., 2001), olfaction (Tsunozaki et al., 2008), and thermotaxis (Hedgecock and Russell, 1975), but how starvation is sensed and communicated to sensory circuits is poorly understood (Milward et al., 2011). A way around this problem is to identify animal state changes that are robustly linked to single identified sensory inputs, providing a defined entry point to dissect how neural networks are reconfigured to encode global states (e.g., Chamero et al., 2007; Kubli and Bopp, 2012; Dewan et al., 2013). Surface exposure is hazardous for some terrestrial invertebrates, for example, due to desiccation and predation, and triggers a switch in behavioral state as animals seek to escape it. Oxygen concentration [O2] is 21% at the surface but lower in buried spaces due to biomass respiration. The nematode C. elegans can recognize surface exposure by measuring [O2] (Gray et al., 2004; Persson et al., 2009). An increase in O2 from 19% to 21% elicits avoidance behaviors: animals reverse and change their direction of travel (McGrath et al., 2009; Persson et al., 2009). If after these maneuvers C. elegans fails to find an environment with lower [O2], they become highly active, suggesting a simple form of arousal associated with escape behavior (Busch et al., 2012). This activated state is sustained for at least 2 hr, and potentially until animals locate an environment with lower O2 levels (Busch et al., 2012). Avoidance and escape from 21% O2 are driven principally by O2-sensing neurons called URX, AQR, and PQR (Gray et al., 2004; Cheung et al., 2005; Zimmer et al., 2009; Busch et al., 2012; Couto et al., 2013). The pair of URX neurons is the most important, and is necessary and sufficient to mediate these responses. In these neurons, rising O2 stimulates an atypical O2-binding soluble guanylate cyclase composed of GCY-35 and GCY-36 subunits (gcy, guanylate cyclase), leading to cGMP channel opening, and activation of L-type Ca2+ channels (Cheung et al., 2004; Gray et al., 2004; Zimmer et al., 2009; Busch et al., 2012; Couto et al., 2013). The response of URX neurons (as well as AQR and PQR) to 21% O2 is tonic, that is, non-adapting, and alters other behaviors besides promoting rapid movement. At 19% O2, C. elegans strongly avoids carbon dioxide (CO2), but at 21% O2 tonic URX signaling suppresses this avoidance (Carrillo et al., 2013; Kodama-Namba et al., 2013). Tonic signaling from the O2 sensors induces C. elegans to leave depleting food patches at much higher rates in 21% O2 (Lima and Dill, 1990; Milward et al., 2011). This behavior is consistent with ecological studies of many species showing that animals tend to leave foraging sites when threat levels rise (Lima and Dill, 1990). The O2-sensing neurons also promote aggregation and accumulation where bacterial food is thickest (Coates and de Bono, 2002; Gray et al., 2004; Rogers et al., 2006). Besides reconfiguring behavior, O2-sensing neurons alter physiology: they regulate lifespan (Liu and Cai, 2013) and body size (Mok et al., 2011). In summary, C. elegans perceives 21% O2 as a threat, and responds to it via a discrete set of O2-sensing neurons whose tonic activity coordinates an altered global organismic state. The striking behavioral switch observed in natural C. elegans isolates at 21% O2 cannot be studied in the laboratory reference strain, N2 (Bristol), due to a gain-of-function mutation in a FMRFamide-like peptide (FLP) receptor, called NPR-1 (neuropeptide receptor family) that arose during domestication (de Bono and Bargmann, 1998; Rockman and Kruglyak, 2009; Weber et al., 2010). Knocking out npr-1 restores to N2 (Bristol) animals strong responses to 21% O2. NPR-1 is expressed in about 20 neural types, including the O2-sensing neurons AQR, PQR, and URX, and their post-synaptic partners RMG and AUA. The NPR-1 215V receptor alters the function of several of these neurons, including URX and RMG, although the mechanisms involved are unclear (Coates and de Bono, 2002; Macosko et al., 2009; Carrillo et al., 2013; Kodama-Namba et al., 2013). Here, we investigate how O2-sensing neurons evoke a change in global C. elegans state in response to 21% O2. We trace information flow from a defined entry point—the URX O2 sensors—to downstream circuits that implement the change in state. We hypothesized that tonic signaling from the O2-sensing neurons URX, AQR, and PQR could reprogram gene expression according to ambient O2 levels. To investigate this possibility, we analyzed the transcriptomes of npr-1(null) mutants (referred to as npr-1) and gcy-35; npr-1 young adult animals grown at 21% and 7% O2 using RNA sequencing (see ‘Materials and methods’). URX, AQR, and PQR neurons do not respond to O2 changes in gcy-35; npr-1 mutants, and exhibit activity levels found in npr-1 animals kept at 7% O2 (Persson et al., 2009; Zimmer et al., 2009; Busch et al., 2012). To prevent npr-1 animals from aggregating, which induces gene expression changes that would confound our analysis (Andersen et al., 2014), we grew animals at low density. We carried out three sets of comparisons. To identify genes whose expression is O2-modulated we compared the transcriptomes of npr-1 animals grown at 21% and 7% O2 (Supplementary file 1). To identify genes regulated by GCY-35-dependent signaling, we compared the transcriptomes of npr-1 and gcy-35; npr-1 animals grown at 21% O2 (Supplementary file 2). And to identify and exclude genes whose expression is altered by growth at different O2 levels independently of gcy-35, we compared the transcriptomes of gcy-35; npr-1 animals grown at 21% and 7% O2 (Supplementary file 3). We then intersected the three comparisons, using as a cut-off q value of 0.05 (see ‘Materials and methods’). If our hypothesis was correct, many of the genes identified as differentially expressed in Supplementary file 1 (npr-1 21% O2 vs npr-1 7% O2) should also be identified in Supplementary file 2 (npr-1 21% O2 vs gcy-35; npr-1 21% O2) but not in Supplementary file 3 (gcy-35; npr-1 21% O2 vs gcy-35; npr-1 7% O2). Consistent with this, we found that 152/210 genes differentially expressed between npr-1 7% O2 versus npr-1 21% O2 were also found in the gcy-35; npr-1 21% O2 versus npr-1 21% O2 comparison. Expression of 72/152 of these genes was not significantly altered by O2 experience in gcy-35; npr-1 animals (Supplementary file 4). For almost all of these genes, 71/72, disrupting gcy-35 had a similar effect on gene expression as growing npr-1 animals at 7% O2 (Supplementary file 4). Genes whose expression was regulated by O2 experience in a GCY-35-dependent way encoded proteins involved in metabolism (e.g., elo-6, a polyunsaturated fatty acid elongase; folt-2, a folate transporter; mai-2, a mitochondrial intrinsic ATPase inhibitor protein), oxidation–reduction reactions (e.g., the cytochrome p450s, cyp-35C1 and cyp-34A2), and proteolysis (e.g., the cathepsins cpr-4 and cpr-6), suggesting broad changes not limited to the nervous system (Supplementary file 4). Efficient escape from aversive environments requires coordinated movement that avoids conflicting behaviors. When exposed to 21% O2 in the presence of food, npr-1 animals not only increased their speed of movement (Busch et al., 2012) (Figure 1A), but also increased the persistence of their forward travel by inhibiting spontaneous short reversals (Figure 1B,C). Mutations in gcy-35, which abolish the O2 responsiveness of URX, AQR, and PQR neurons, disrupted O2 modulation of both speed (Busch et al., 2012) and spontaneous reversal frequency (Figure 1B). Expressing gcy-35 selectively in URX neurons restored rapid movement and sustained inhibition of reversals at 21% O2. URX neurons thus provide a defined entry point to the circuit controlling the behavioral state switch evoked by 21% O2 in npr-1 animals. RMG activation induces rapid and persistent forward movement. (A and B) URX O2 sensors provide an entry point to the circuit controlling response to 21% O2. Selective expression of GCY-35 in URX neurons restores rapid (A) and persistent (B) forward movement at 21% O2 to gcy-35; npr-1 animals on food. Statistics compare rescued (blue) and mutant (red) animals at time points indicated by the black bars. (C) 21% O2 causes npr-1 animals on food to suppress the short, frequent reversals observed at 7% O2. Reversal probability is calculated per 1 s. (D) Ablating URX abolishes the Ca2+ responses evoked in RMG by 21% O2; unc-64 syntaxin loss-of-function mutants show a partial reduction in this response. Here, and in subsequent panels, black bars indicate time intervals for statistical comparison of responses at 21% and 7% O2 using the Mann–Whitney U test. ***p<0.001; **p<0.01; *p<0.05; NS, not significant. (E and F) Stimulating RMG using channelrhodopsin evokes rapid movement (E) and inhibits backward movement (F) in npr-1 animals kept at either 7% or 21% O2 with food. Here and in subsequent panels, red bars indicate time intervals used for statistical comparisons of responses when light is on to when it is off. ***p<0.001, **p<0.01; *p<0.05; NS, not significant. (G–I) Channelrhodopsin stimulation of RMG can induce rapid movement when AQR, PQR, and URX neurons are ablated. Data plotted in (I) are replotted from G and H. (J) URX Ca2+ responses evoked by 21% O2 are strongly attenuated when RMG is ablated. (K) URX neurons retain O2-evoked Ca2+ responses in unc-64 syntaxin mutants, although baseline Ca2+ is reduced. Each line in this panel (and, unless specified, in subsequent panels) represents the mean response of all animals of one genotype or condition. Error bars (lighter shading) in all panels show standard error of the mean. Gray areas indicate periods of higher O2 concentration; blue areas indicate periods with blue light (0.26 mW/mm2) on; orange areas indicate periods with green light (0.64 mW/mm2) on. Among the three O2-sensing neurons, URX neurons uniquely make gap junctions and reciprocal synaptic connections with the RMG interneurons (White et al., 1986; wormwiring.org; Figure 1—figure supplement 1). The RMG interneurons respond to a 7–21% rise in O2 with a sustained increase in Ca2+, and ablating RMG disrupts behavioral responses evoked by this O2 switch (Busch et al., 2012). To show that O2-evoked Ca2+ responses in RMG reflect input from URX, we ablated URX and imaged RMG using the YC2.60 Ca2+ sensor (Horikawa et al., 2010). 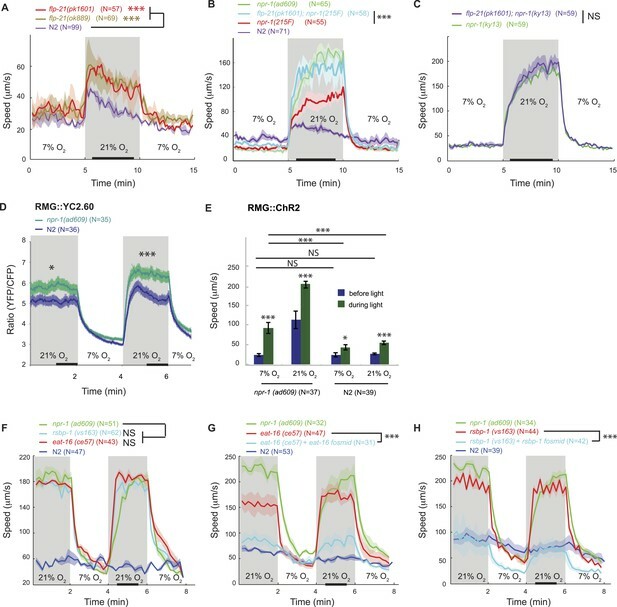 When URX was ablated, O2 stimuli failed to evoke Ca2+ responses in RMG (Figure 1D), and RMG Ca2+ resembled that found in tax-4 mutants, which lack the cGMP-gated channel required for URX, AQR, and PQR neurons to transduce O2 stimuli (Figure 1D). These data suggest that O2-evoked Ca2+ responses in RMG are driven by URX input. Is depolarizing RMG sufficient to switch C. elegans behavioral state? To address this we used channelrhodopsin-2 (ChR2; Nagel et al., 2005) to selectively stimulate RMG in npr-1 animals kept at 7% O2. Stimulating RMG inhibited spontaneous reversals and induced rapid and persistent forward movement for as long as blue light was on (Figure 1E,F). Stimulating RMG neurons is thus sufficient to confer a highly active locomotory state on npr-1 animals kept at 7% O2. In npr-1 animals, URX neurons respond in a graded manner to changes in O2 between 7% and 21%, and evoke graded increases in locomotory rate according to final O2 concentration (Cheung et al., 2005; Busch et al., 2012). To investigate the dynamic range of URX–RMG signaling, and to examine if graded RMG activity can evoke graded changes in the animal's speed, we stimulated RMG in animals kept at either 7% O2 or 21% O2. The effects of activating RMG using ChR2 summated with input from the O2 sensory circuit: animals kept at 21% reached higher speeds and inhibited reversals more strongly than animals kept at 7% (Figure 1E,F). These data suggest that the dynamic range of the circuit permits higher levels of RMG activation to evoke qualitatively similar but quantitatively stronger behavioral responses. RMG and URX are connected by gap junctions and by reciprocal chemical synapses. Stimulating RMG using ChR2 could therefore alter behavior by activating URX. To test this, we selectively activated RMG using ChR2 in animals ablated for URX (and AQR and PQR). Ablated animals robustly increased their speed and suppressed reversals upon light-activation of RMG, both at 7% and at 21% O2 (Figure 1G,H). As expected if O2 input was lost, the speed responses of the ablated animals were not influenced by the O2 levels (Figure 1I). The ability of RMG stimulation to induce rapid movement and inhibit reversals in the absence of URX, AQR, and PQR neurons suggests that feed-forward signaling from RMG to other neurons evokes these behaviors. Our results did not exclude that RMG influences URX activity. To investigate this possibility, we ablated RMG neurons in L1 larvae and imaged URX Ca2+ responses in young adults 2 days later. npr-1 animals lacking RMG showed a much smaller URX Ca2+ response to a 7–21% O2 stimulus compared to mock ablated controls (Figure 1J). Thus, not only does URX activate RMG in response to rising O2, but RMG input somehow regulates URX excitability. Although the gap junctions and synaptic connections between URX and RMG provide a direct route for such communication, we cannot exclude more indirect mechanisms. However, consistent with a role for synaptic input in sustaining URX excitability, partial loss-of-function mutants of unc-64 syntaxin, which have deficits in synaptic release, showed reduced Ca2+ levels in URX and RMG both at 7% and 21% O2 (Figure 1D,K). URX neurons could still evoke Ca2+ responses in RMG in unc-64 mutants (Figure 1D). However, since the unc-64 allele we used is a partial loss-of-function (null mutants are dead), we cannot draw firm conclusions about the relative roles of gap junctions and synaptic transmission in mediating URX–RMG communication. Excessive signaling from a hyperactive neuropeptide receptor, NPR-1 215V, prevents N2 (Bristol) animals from moving rapidly on food at 21% O2 (de Bono and Bargmann, 1998; Cheung et al., 2005). The RMG neurons are one site of action for this receptor: expressing NPR-1 215V selectively in RMG reduces the locomotory activity of npr-1 animals (Macosko et al., 2009). Does NPR-1 215V expression in RMG inhibit responses evoked by a switch from 7% to 21% O2? 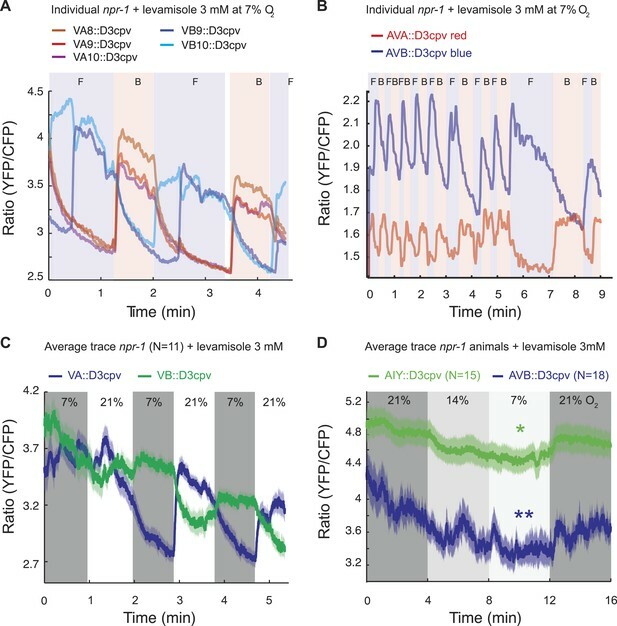 npr-1 animals that expressed NPR-1 215V in RMG did not exhibit long-lasting changes in locomotion in response to changes in O2 (Figure 2, Figure 2—figure supplement 1A,B). However, they retained the transient bout of reversals and reorientation triggered by a sharp rise in O2 (Figure 2—figure supplement 1C). Thus, NPR-1 215V receptor signaling in RMG selectively suppresses the sustained switch in locomotory behavior evoked by high and low O2. A different circuit may act downstream of O2 sensors to evoke transient avoidance responses, consistent with the observation that activating RMG using ChR2 failed to induce reversals. FLP-21/NPR-1 ligand/receptor signaling limits RMG circuit output downstream of RMG cell body Ca2+. (A–C) Disrupting the flp-21 FMRF-like neuropeptide enables N2 animals to respond to 21% O2 with a persistent increase in locomotory activity (A), and increases the amplitude of such responses in animals expressing the natural npr-1 215F receptor allele (B) but not in npr-1(ky13null) mutants (C). (D) The npr-1 215V allele only slightly reduces the Ca2+ responses evoked by 21% O2 in RMG. (E) RMG stimulation using ChR2 only weakly stimulates movement in N2 animals, both at 7% and 21% O2, contrasting with its effects in npr-1 animals. (F–H) Knocking out eat-16, a member of the RGS7 family that inhibits Gq signaling, or its interacting partner rsbp-1, enables N2 animals to switch to rapid movement at 21% O2. The FMRFamide neuropeptide encoded by the flp-21 gene is an in vivo ligand for NPR-1 (Rogers et al., 2003). flp-21 is expressed in several neurons, including RMG itself (Kim and Li, 2004; Macosko et al., 2009). FLP-21 peptide release could therefore serve to limit the O2-evoked behavioral state switch by activating NPR-1 signaling in RMG. Consistent with this, deleting flp-21 caused animals expressing the natural npr-1 215F or derived npr-1 215V allele, but not npr-1(null) mutants, to increase the amplitude of their O2-evoked behavioral switch (Figure 2A–C). How does the NPR-1 neuropeptide receptor inhibit RMG function? Using the YC2.60 sensor, we compared the Ca2+ responses evoked in RMG by a 7–21–7% O2 stimulus train in N2 and npr-1 mutants. N2 animals exhibited reduced Ca2+ responses in RMG compared to npr-1 mutants (Figure 2D), which would be consistent with NPR-1 215V inhibiting RMG Ca2+ signaling. However, the effects, although statistically significant, were surprisingly small compared to the strong inhibitory effects of NPR-1 215V signaling on O2-evoked behaviors. More importantly, the promoter combination targeting YC2.60 expression to RMG (pncs-1::cre and pflp-21::LoxP-STOP-LoxP::YC2.60) drove lower expression in N2 compared to npr-1 animals (Figure 2—figure supplement 2A). Lower sensor expression correlated with lower YFP/CFP ratio at 21% O2 (Figure 2—figure supplement 2B), suggesting that sensor expression differences could account for much of the YFP/CFP ratio differences between N2 and npr-1 animals (see below for an explanation of why pflp-21 drove lower RMG expression in N2 compared to npr-1 animals). These observations led us to speculate that the main inhibitory role of NPR-1 was downstream of Ca2+ influx. To test this, we compared the effects of stimulating RMG neurons with ChR2 in N2 and npr-1 animals. If NPR-1's inhibitory role is predominantly downstream of Ca2+ entry, ChR2-activation of RMG should have little effect in N2 animals. 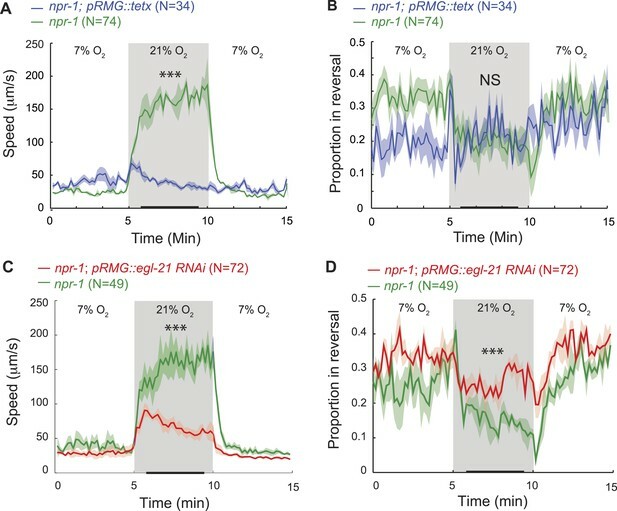 Consistent with this, light activation of RMG triggered only a small increase in N2 locomotory activity, regardless of whether animals were kept at 21% or 7% O2, and in marked contrast to its effects in npr-1 mutants (Figure 2E). Most compellingly, although npr-1 mutants kept at 7% O2 had much lower Ca2+ in RMG compared to N2 animals kept at 21% O2 (Figure 2D), they responded to RMG ChR2 activation significantly more strongly (Figure 2E). These results suggest that the inhibitory effects of npr-1 215V occur predominantly downstream of the Ca2+ responses in RMG, possibly at the presynaptic level. A network of G protein pathways modulates neurotransmission presynaptically: Gq and Gs signaling stimulates neurotransmitter release whereas Go/i signaling inhibits it, possibly by negatively regulating Gs and Gq signaling (Miller et al., 1999; Nurrish et al., 1999). In vitro work suggests that the NPR-1 215V and NPR-1 215F receptors can each couple to Go/i signaling following stimulation by FLP-21 (Rogers et al., 2003). If NPR-1 215V inhibits neurotransmission by activating Go, then mutations that promote Gq/Gs signaling over Go signaling should restore O2 control of locomotory state and mimic npr-1 mutants. The RGS (regulator of G protein signaling) protein EAT-16 terminates Gq signaling by activating intrinsic Gq GTPase activity (Hajdu-Cronin et al., 1999); RSBP-1 (R7 binding protein 1 homolog) interacts with and is required for EAT-16 activity (Porter and Koelle, 2010). Disrupting either eat-16 or rsbp-1 enabled N2 animals, which express npr-1 215V, to behave like npr-1 mutants in response to a change in O2 (Figure 2F–H). Together, these results suggest that a change in the balance of Go/Gq signaling in a subset of neurons explains how the NPR-1 215V neuropeptide receptor controls behavior. Animals integrate information across multiple sensory modalities to respond appropriately to changing environments. The ASK sensory neurons respond to pheromones and food (Macosko et al., 2009; Wakabayashi et al., 2009), and, like the URX O2 sensors, make gap junctions with RMG (White et al., 1986; wormwiring.org; Figure 1—figure supplement 1). Previous work suggested that cGMP signaling in ASK is required for npr-1 animals to move rapidly and to aggregate (Tremain, 2004; Macosko et al., 2009), leading to the hypothesis that ASK neurons are a major output of the RMG hub-and-spoke circuit (Macosko et al., 2009). The ASH and ADL nociceptive neurons also make gap junctions with RMG (Figure 1—figure supplement 1). Previous work suggested that TRPV signaling in ASH and ADL promotes aggregation behavior and avoidance of high O2 (de Bono et al., 2002; Chang et al., 2006; Rogers et al., 2006). Together, these results suggested that gap-junctional communication across the RMG circuit integrates multiple sensory cues and is necessary for npr-1 animals to move rapidly at 21% O2 and to aggregate (Macosko et al., 2009). To investigate this model in the context of O2-evoked responses, we used the YC3.60 reporter to examine if changing [O2] altered [Ca2+] in ASK or ASH neurons in npr-1 animals. A switch from 7% to 21% O2 elicited a small increase in YFP/CFP FRET in ASK and ASH, indicating a rise in [Ca2+] (Figure 3A,B). The responses were sustained while animals were at 21% O2. Deleting gcy-35 abolished the O2-evoked Ca2+ responses in ASK and ASH (Figure 3A,B), consistent with these responses being driven by URX, and therefore potentially via RMG. These results indicate that O2 input can indeed modify ASK and ASH Ca2+ levels, but the effect is small—at least at the cell body, where we made our measurements. ASK, ASH, and ADL neurons are not necessary for the RMG circuit to stimulate rapid movement at 21% O2. (A and B) In npr-1 animals a 7% O2 to 21% O2 stimulus evokes a small rise in Ca2+ in ASK (A) and ASH (B) neurons. These responses are abolished in gcy-35; npr-1 animals. 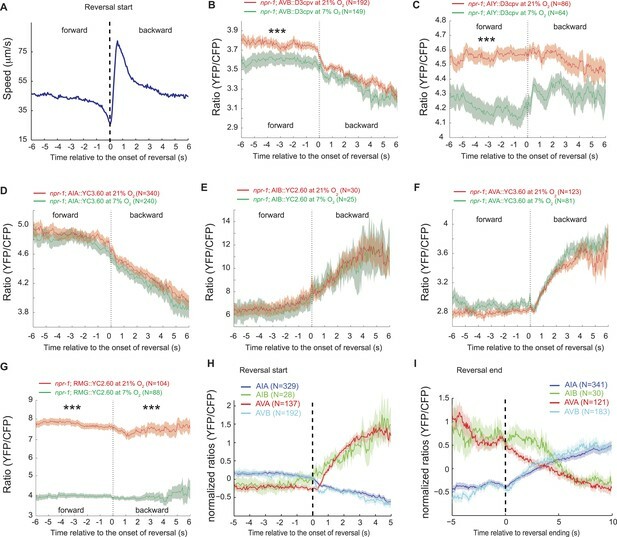 (C and D) Ablating ASK (C), or acutely inhibiting its activity using halorhodopsin (D) did not alter the locomotory behavior of npr-1 animals on food at 7% or 21% O2. (E) Stimulating RMG using ChR2 can stimulate locomotion in npr-1 animals kept at 7% O2 in the absence of ASH and ADL neurons. (F) Inhibiting synaptic release from ASH and ADL using tetanus toxin disrupts avoidance of Cu2+ (inset) but does not inhibit the behavioral state switch evoked by changing O2. To ask if ASK neurons contributed to O2-evoked behavioral states, we ablated ASK in npr-1 animals by targeted expression of the egl-1 cell death gene (Wakabayashi et al., 2004). ASK ablation was confirmed by dye filling and using a psra-9::YC3.60 fiduciary marker. npr-1 animals lacking ASK neurons responded to a 7–21–7% O2 regime indistinguishably from control npr-1 animals (Figure 3C). Optogenetic inhibition of ASK, in an npr-1 strain expressing halorhodopsin (NpHR) specifically in ASK, had no effect on speed (Figure 3D). Ablating ASK neurons in npr-1 animals also did not impair aggregation behavior (Figure 3—figure supplement 1). Aggregation is highly sensitive to O2 circuit function and is disrupted in gcy-35 mutants (Cheung et al., 2004; Gray et al., 2004; Rogers et al., 2006). These data suggest that ASK neurons are not necessary for O2-evoked behavioral responses, or for aggregation. To investigate if ASH and ADL are required for the O2-controlled behavioral state switch, we ablated these neurons in npr-1 animals expressing channelrhodopsin in RMG, using targeted expression of a miniSOG gene and light-induced ablation (Qi et al., 2012). The ASH and ADL ablated animals responded to high and low O2 and to current injection into RMG like npr-1 controls (Figure 3E). Tetanus toxin in the ASH and ADL neurons also did not disrupt O2 responses (Figure 3F). To monitor toxin expression, we used a polycistronic construct that also expressed RFP, and we confirmed that tetanus toxin disrupted synaptic release from ASH and ADL by monitoring reversals in response to a 3 mM Cu2+ drop (Figure 3F, inset). Thus, ablating ASK alone, or ASH and ADL together, does not disrupt relay of O2-modulated RMG activity to downstream circuits that promote rapid movement. The ASH and ADL neurons express the TRPV1 homolog ocr-2, and disrupting ocr-2, or its partner subunit osm-9, attenuates animals' ability to navigate spatial O2 gradients and to aggregate (de Bono et al., 2002; Chang et al., 2006; Rogers et al., 2006). ocr-2; npr-1 animals only weakly modulated their locomotory activity when switched between 7% and 21% O2 (Figure 4A). Expressing ocr-2 cDNA in ASH or ADL or the serotonergic ADF neurons increased the speed of ocr-2; npr-1 animals at 21% O2 and, as expected, rescued the bordering and aggregation phenotype (Figure 4A, Figure 4—figure supplement 1A) (de Bono et al., 2002; Chang et al., 2006). The ability of ocr-2 expression in ASH or ADL neurons to rescue the speed response and aggregation behavior of ocr-2; npr-1 animals was retained when neurotransmission from these neurons was blocked using tetanus toxin (Figure 4B,C, Figure 4—figure supplement 1B). These data suggest that ocr-2 TRPV activity in ASH and ADL is unlikely to promote O2 responses by facilitating these neurons' neurosecretory activity, but may instead influence their gap junctional communication, for example, with RMG. Disrupting a TRPV channel in ASH, ADL, and ADF neurons attenuates locomotory responses to 21% O2. (A) The switch to rapid movement evoked in npr-1 animals by 21% O2 is attenuated in the absence of the OCR-2 TRPV channel. This defect of ocr-2; npr-1 animals can be rescued to varying extents by expressing ocr-2 cell-specifically in ASH, ADL, or ADF neurons. (B and C) The ability of pADL::ocr-2 (B) or pASH::ocr-2 (C) transgenes to rescue the ocr-2; npr-1 O2 phenotype does not depend on synaptic release. Synaptic release was inhibited by expressing tetanus toxin in ASH and ADL neurons, using the gpa-11 promoter. (D) Channelrhodopsin stimulation of ASH neurons restores modulation of locomotory activity by 21% O2 to ocr-2; npr-1 animals. (E and F) 2 mM Cu2+ elicited strong Ca2+ responses in ASH neurons of N2 and npr-1 animals (E) but did not alter Ca2+ in the RMG neurons (F). (G and H) Disrupting ocr-2 did not significantly reduce O2-evoked Ca2+ responses in the cell bodies of URX (G) or RMG (H) neurons. (I–K) Stimulating RMG in ocr-2; npr-1 animals kept on food using channelrhodopsin can partly restore O2 modulation of locomotory activity. The OCR-2/OSM-9 TRPV channel is required for the ASH and ADL neurons to respond to sensory inputs (Hilliard et al., 2004). If disrupting ocr-2 reduces ASH and ADL tonic or chronic activity, it could decrease RMG activity by reducing current input into RMG, or by shunting current away from RMG through the ASH–RMG and ADL–RMG gap junctions (Figure 1—figure supplement 1). If this model is correct, injecting current into ASH or ADL using ChR2 should restore to ocr-2; npr-1 mutants rapid movement at 21% O2. To test this, we expressed ChR2 specifically in ASH by using the FLP/FRT system and by monitoring expression using YFP-tagged ChR2 (see ‘Materials and methods’). We exposed transgenic animals to constant blue light of different intensities, ranging from 0.005 to 0.05 mW/mm2. As expected, control animals not exposed to blue light did not strongly modulate their speed when switched between 7% and 21% O2 (Figure 4D). By contrast, animals exposed to 0.005, 0.015 or 0.05 mW/mm2 of continuous blue light modulated their locomotory state according to O2 levels (Figure 4D). The amplitude of the O2-evoked change in locomotory activity was similar to that obtained when we selectively restored ocr-2 expression to ASH in ocr-2; npr-1 animals (compare Figure 4C,D). Thus, injecting a constant Ca2+/Na+ current into ASH neurons is sufficient to restore O2 modulation to the circuit in ocr-2; npr-1 animals. This suggests that the effects of the ocr-2 mutation are not developmental, as they can be rescued in adult animals. Our results support a model in which tonic or chronic ASH (and ADL) activity facilitates O2-evoked behavioral switches either by injecting current into RMG or by reducing shunting from the RMG circuit. A rise in O2 evoked a small increase in ASH Ca2+ (Figure 3B), suggesting that depolarizing current flows from RMG to ASH in npr-1 animals at 21% O2. To test explicitly if current can flow in the reverse direction, from ASH to RMG, we asked if strongly activating ASH using a noxious stimulus evoked a rise in RMG Ca2+. As expected, a 10 mM Cu2+ stimulus resulted in a large, sharp rise in ASH Ca2+ that was easily detectable using YC3.60 (Hilliard et al., 2004) (Figure 4E). By contrast, this stimulus failed to evoke any Ca2+ responses in the RMG cell body that could be measured with YC2.60 (Figure 4F). These results suggest that the anatomically defined gap junctions may not allow significant Ca2+ current to flow from the ASH to the RMG cell body under our imaging conditions. How, then, does OCR-2 promote RMG activity? An alternative model is that by tonically/chronically depolarizing ASH and ADL neurons, OCR-2 reduces the current flowing from RMG to ASH and ADL via gap junctions. 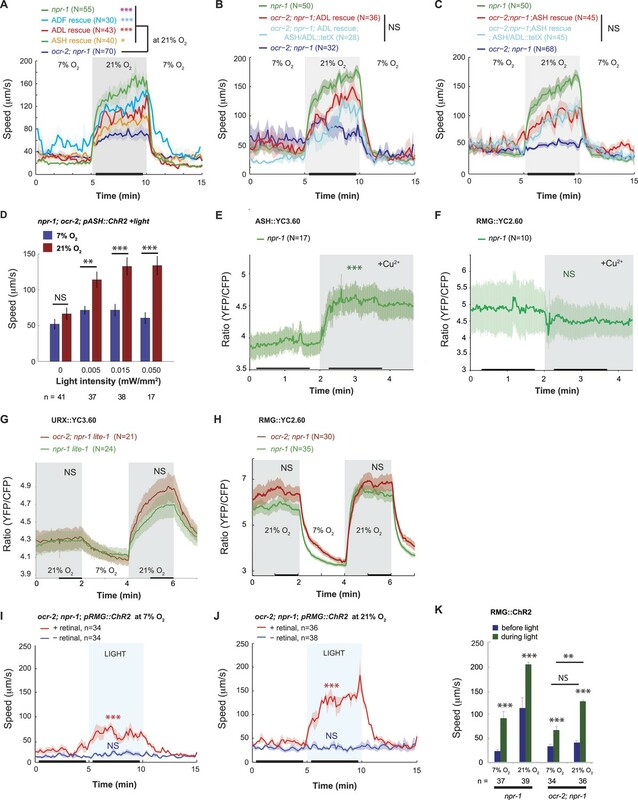 In ocr-2; npr-1 mutants, a more negative membrane potential in ASH and ADL leads to more current being shunted from RMG to the nociceptive neurons, reducing RMG activity. To test this hypothesis, we compared O2-evoked Ca2+ responses in URX and RMG in npr-1 and ocr-2; npr-1 animals (Figure 4G,H). Surprisingly, the steady state Ca2+ levels in the URX or RMG cell bodies were not significantly affected by the ocr-2 mutation. Since the tetanus toxin experiments suggested that rescue of the ocr-2; npr-1 phenotype by a pASH::ocr-2 transgene did not require synaptic transmission, we speculate that the Ca2+ effects of disrupting ocr-2 are local to the gap junctions and not visible at the RMG cell body. Alternatively, ASH and ADL have the potential to leach away some other excitatory factor from RMG via gap junctions, and OCR-2 activity in ASH and ADL can attenuate this. If loss of the OCR-2 TRPV channel somehow reduced the functionality of RMG, injecting current directly into RMG should rescue the phenotype of ocr-2; npr-1 animals. Consistent with this, ChR2-activation of RMG in ocr-2; npr-1 animals stimulated rapid movement, and inhibited reversals, both at 21% and 7% O2 (Figure 4I,J and data not shown). This contrasts with the failure of ChR2-driven RMG activation to drive tonic changes in behavioral state in N2 animals (which express the NPR-1 215V receptor) (Figure 2F). These results suggest that the OCR-2-expressing neurons can facilitate RMG signaling in a way that is upstream of NPR-1 signaling. Genetically encoded Ca2+ sensors are blind to signaling mechanisms that modulate neurosecretion without altering Ca2+ (Miller et al., 1999; Nurrish et al., 1999; Rhee et al., 2002; Oda et al., 2011). This limitation prompted us to seek a way to monitor enduring changes in neurosecretion as readouts of different global states. In vertebrates, several studies have reported that increased neural activity is associated with increased neuropeptide gene transcription (Uhl and Nishimori, 1990). In pancreatic β cells, feedback mechanisms couple insulin production and release (Borgonovo et al., 2006). If transcription of most neuropeptide genes is coupled to peptide release, promoter::GFP reporters for such genes should provide a readout of peptidergic circuit activity. To test this, we first studied a pflp-11::GFP reporter expressed in the URX, AUA, and SAB neurons (Kim and Li, 2004). URX and AUA both show tonically elevated Ca2+ at 21% O2 compared to 7% O2 (Busch et al., 2012). Cultivating animals in 7% O2, or deleting gcy-35, reduced pflp-11::gfp expression in both URX and AUA (Figure 5A). By contrast, knocking out ocr-2 did not, suggesting that TRPV signaling did not alter URX or AUA peptide expression (Figure 5A). The genotype at the npr-1 locus did not affect pflp-11::gfp expression in URX, but expression in the AUA neurons was reduced in animals encoding the npr-1 215V allele compared to npr-1 null mutants (Figure 5A). pflp-11::gfp expression in SAB, a neuron not known to be modulated by O2, was not affected either by O2 experience or the genotypes tested, providing an internal control. These data are consistent with pflp-11 expression reporting neural activity. Neuropeptide gene expression levels report neurosecretory activity. (A) Expression of a pflp-11 reporter in URX, AUA, and SAB neurons in different genotypes and at different O2 tensions. In this and subsequent panels, AU = arbitrary units. (B) Expression of pflp-11::GFP in URX is inversely related to expression of a gain-of-function K+ channel, EGL-2(GF), in the same neuron. Expression of the K+ channel can be tracked due to co-expression of RFP in an operon. (C) Blocking exocytosis from URX by targeted expression of tetanus toxin strongly reduces expression of pflp-11::GFP in URX. Expression of tetanus toxin can be tracked due to co-expression of RFP in an operon. (D) Expression of a pflp-5 reporter in RMG, ASE, and M4 in different genotypes and at different O2 tensions. (E) Blocking exocytosis from RMG by targeted expression of a tetanus toxin strongly reduces expression of pflp-5::GFP in RMG. Expression of tetanus toxin can be tracked due to co-expression of RFP in an operon. (F) Expression of a pflp-21 reporter that includes 4 kb of upstream sequences in URA (probably), RMH, ASJ, M2, FLP, and RMG neurons in different genotypes and at different O2 tensions. (G) Expression of a pflp-21 reporter that includes 2 kb of upstream sequences in M2, URA (probably), ASH, ADL, and ASJ neurons in different genotypes and at different O2 tensions. (H) Blocking exocytosis from ASH by targeted expression of a tetanus toxin reduces expression of pflp-21 (2 kb)::GFP in ASH. Expression of tetanus toxin can be tracked due to co-expression of RFP in an operon. (I–K) Expression of ppdf-1::gfp (I), pflp-17::gfp (J) or pflp-3::gfp (K) reporters in different neurons in different genotypes at different O2 concentrations. For (A, D, F, G, I, J, and K), asterisks indicate comparisons to npr-1 animals kept at 21% O2, *p<0.05; ***p<0.001. To test more explicitly if modulation of pflp-11::gfp expression levels was related to neuron depolarization state, we inhibited URX by expressing a constitutively active K+ channel related to Drosophila ether-a-go, EGL-2(GF) (Weinshenker et al., 1999). This transgene abolishes behavioral responses evoked by 21% O2 (Cheung et al., 2005). EGL-2(GF) expression strongly reduced pflp-11::gfp expression in URX (Figure 5B). We next tested if feedback control of pflp-11::gfp expression was coupled to peptide release downstream of Ca2+. To selectively block neurosecretion from URX, we cell-specifically expressed tetanus toxin, which cleaves synaptobrevin (Schiavo et al., 2000). Tetanus toxin expression strongly reduced pflp-11::gfp expression in URX, and the effect was stronger when toxin expression was higher (Figure 5C). These results suggest that pflp-11::gfp expression is coupled to peptide release in URX, and that peptide gene reporters may be useful surrogates to monitor long-term neurosecretory activity. To test this hypothesis further, we examined a pflp-5::GFP transgene expressed in the RMG, ASE, and M4 neurons (Kim and Li, 2004). pflp-5::gfp expression in RMG was higher in npr-1 animals grown at 21% O2 than in npr-1 animals grown at 7% O2 or gcy-35; npr-1 mutants grown at 21% O2 (Figure 5D). These data suggest that pflp-5::gfp reporter expression is also coupled to neural activity. In contrast, expression of pflp-5::GFP in the M4 pharyngeal neuron, which is not known to respond to O2, was not altered by O2 experience or by disrupting gcy-35. To explore if pflp-5 expression in RMG, like pflp-11 expression in URX, was coupled to peptide release, we blocked RMG neurosecretion by cell-specifically expressing tetanus toxin. Animals expressing tetanus toxin in RMG showed significantly less pflp-5 expression in RMG than non-expressing siblings (Figure 5E), consistent with neurosecretion feeding back to stimulate pflp-5 transcription. Expression of pflp-5::gfp in RMG was reduced in N2 animals compared to npr-1 mutants, both at 21% and 7% O2. Since at 21% O2 RMG Ca2+ levels were not strikingly different between N2 and npr-1 mutants (Figure 2E), our data support a model in which NPR-1 215V signaling acts either downstream of Ca2+ or locally to inhibit RMG neurosecretion. Interestingly, ocr-2; npr-1 animals kept at 21% O2 also showed reduced pflp-5::gfp expression compared to npr-1 worms kept at the same O2 levels (Figure 5D), suggesting that disrupting ocr-2 reduced RMG neurosecretion in npr-1 animals. We next studied expression from a long version of the flp-21 promoter that drives GFP expression in URA, M4, M2, ASJ, RMH, and RMG (Macosko et al., 2009). The RMH interneurons make gap junctions with RMG (White et al., 1986; wormwiring.org). Expression of the long pflp-21::GFP transgene in RMG and RMH was highest in npr-1 animals cultivated at 21% O2, and reduced in gcy-35; npr-1 and ocr-2; npr-1 animals grown at 21% O2, as well as npr-1 animals kept overnight at 7% O2 (Figure 5F). pflp-21::GFP transgene expression in RMG and RMH was reduced in N2 animals compared to npr-1 mutants, both at 21% and 7% O2, supporting a model in which NPR-1 215V signaling inhibits neurosecretion from these neurons (Figure 5F). Thus, expression in RMG neurons driven from the long flp-21 promoter and the flp-5 promoter is regulated very similarly by O2 experience and genotype at the npr-1 and ocr-2 loci. Together, our data suggest that neurosecretion from RMG and RMH is tonically modulated by O2 levels and TRPV signaling. A shorter version of the flp-21 neuropeptide gene promoter drives GFP expression in the ADL, ASH, ASJ, URA, M4, and M2 neurons (Kim and Li, 2004). We wondered if this promoter could provide readouts of ASH and ADL signaling. Disrupting the ocr-2 TRP channel subunit strongly reduced expression of the short pflp-21::gfp transgene in ASH and ADL in npr-1 animals (Figure 5G). For ASH, we showed that expressing tetanus toxin also reduced pflp-21::gfp expression in this neuron (Figure 5H). These results are consistent with tonic/chronic OCR-2-dependent neurosecretory activity in these neurons driving a feedback loop to promote transcription of neuropeptides. Changing O2 levels in npr-1 animals did not significantly alter expression of this shorter pflp-21::gfp in ASH and ADL, suggesting that O2 modulation of ASH and ADL secretion, if it occurs, is minor (Figure 5G). Note that npr-1 is expressed in ASH neurons (Figure 1—figure supplement 1), which may account for differences in pflp-21::gfp expression in this neuron between npr-1 and N2 animals. These data are consistent with the ablation studies and the Ca2+ imaging data for ASH, which suggest that ASH neurons exhibit only weak O2-evoked changes in Ca2+ and are dispensable for the O2-evoked behavioral switch. Encouraged by our results, we looked for other neuropeptide genes that are reported to be expressed in neurons connected to the O2-sensing circuit by gap junctions or synapses. One such gene encodes the C. elegans ortholog of pigment dispersal factor, pdf-1 (Barrios et al., 2012; Meelkop et al., 2012). A ppdf-1::gfp transgene is expressed in PVP and AVB, two neurons heavily connected with O2-sensing neurons: PVP has gap junctions with AQR and PQR, whereas AVB has gap junctions with AQR and receives synaptic input from AQR, URX, and RMG. Expression of ppdf-1::gfp in both PVP and AVB was upregulated at 21% O2 compared to 7% O2, suggesting that the activity of these neurons is also modulated by O2 (Figure 5I and see below). The expression of ppdf-1::gfp in RMG from the transgene was too weak and variable to be assayed. Finally, we studied the expression of two additional peptide genes to demonstrate that not all neuropeptide promoters are stimulated by exposure to 21% O2. The neuropeptide FLP-17 is expressed by BAG neurons and released when BAG is depolarized in vitro (Ringstad and Horvitz, 2008; Smith et al., 2013). BAG neurons are stimulated by low O2 concentrations (Zimmer et al., 2009). As expected, pflp-17::gfp expression in BAG was stimulated at 7% O2 compared to 21% O2 (Figure 5J). The neuropeptide FLP-3 is expressed in the IL1 neurons (Kim and Li, 2004), which are part of a touch-responsive circuit, are poorly connected to known O2-modulated neurons, and do not express NPR-1. pflp-3::gfp expression in IL1 was not regulated by O2 or npr-1 (Figure 5K). Together, our data suggest that O2 levels regulate flp-11, flp-5, flp-21, flp-17, and pdf-1 peptide gene expression and peptide release in multiple neurons, including URX, AUA, RMG, RMH, BAG, PVP, and AVB, but not URA, SAB, IL1, M2, and M4. They also suggest that peptide release from RMG is stimulated by O2-sensing neurons, depends on OCR-2 TRPV signaling, and is inhibited by NPR-1 215V signaling. Previous work has shown that RMG activity is necessary for high locomotory activity at 21% O2 (Macosko et al., 2009; Busch et al., 2012). We have shown that RMG activity is sufficient to drive high locomotory activity, and that ASH, ADL, and ASK are each dispensable for these effects. Does peptidergic signaling from RMG contribute to driving high locomotory activity at high O2? We first tested the effects of blocking all neurosecretion from RMG using cell-specific expression of a tetanus toxin transgene in npr-1. To monitor expression, we used a polycistronic construct that co-expressed the toxin with RFP. Animals expressing the transgene lost any tonic response to high O2 and remained very poorly active at all O2 concentrations (Figure 6A,B). This was expected from previous work (Macosko et al., 2009), although that study did not explicitly examine O2-evoked responses. We next tested more specifically if neuropeptides secreted from RMG were required, using cell-specific RNAi to knock down the carboxypeptidase E (CPE) egl-21 in RMG. Carboxypeptidase E removes C-terminal lysine and arginine residues from pro-peptides during maturation, and analysis of peptide extracts from egl-21 mutants shows a deficit in the maturation of most C. elegans neuropeptides (Husson et al., 2007). npr-1 animals with selective RNAi knockdown of egl-21 in RMG moved appropriately slowly in 7% O2, but sped up much less than non-transgenic siblings when switched to 21% O2 (Figure 6C) and reversed more frequently (Figure 6D). These results indicate that neuropeptide release from the RMG neurons plays a major role in evoking the highly active state of feeding C. elegans at 21% O2. RMG neuropeptide secretion drives rapid movement at 21% O2. (A–D) Selective expression of tetanus toxin (A and B) or RNAi knockdown of EGL-21 carboxypeptidase E (C and D) in RMG inhibits the O2-evoked switch in locomotory state. NS, not significant; ***p<0.001. Ultimately, changes in O2 levels modify behavioral state by altering motor circuits. We envisioned three ways by which O2 circuit output might alter downstream circuits. In one model, the downstream circuits would exhibit O2-evoked tonic changes in Ca2+ levels, much as we observe in the URX, AQR, PQR, AUA, and RMG neurons (Busch et al., 2012). 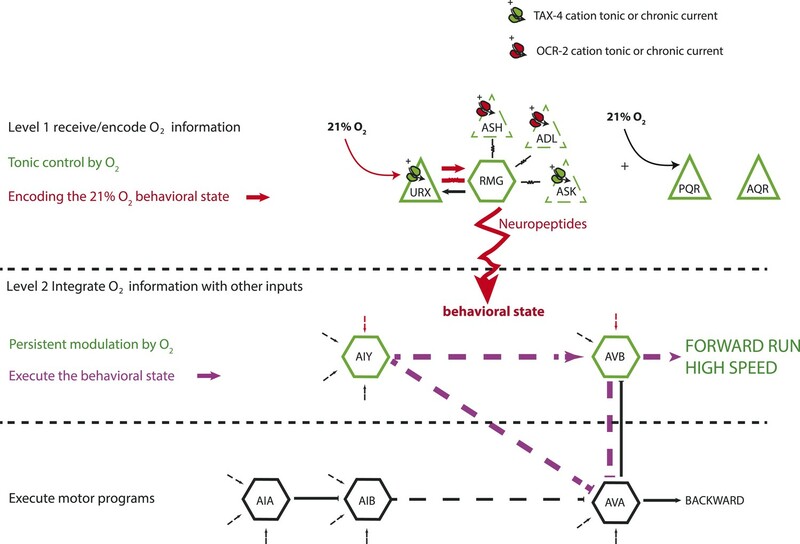 In a different model, behavioral state would be encoded across multiple neurons whose activity does not faithfully track O2 concentration, but which on average show O2-evoked changes in Ca2+ levels. To investigate these possibilities, we used Ca2+ indicators to image the activity of motoneurons, and of interneurons in layers upstream of motoneurons, at different O2 environments. The third possibility would not involve regulation of Ca2+ levels, but rather presynaptic effects that would only be observed using other reporters, such as the peptide promoter assay. We focused our studies on four sets of neurons: the A and B motoneurons, which are thought to mediate reverse and forward movement, respectively; the AVA ‘command’ interneurons, which promote backward movement by ensuring that the A motoneurons are more active than the B motoneurons; the AVB ‘command’ interneurons which promote forward movement by ensuring that the B motoneurons are more active than the A motoneurons; and the AIY interneurons which do not have anatomically defined connections with URX or RMG but are post-synaptic to multiple other sensory neurons (White et al., 1976, 1986; Chalfie et al., 1985; Kawano et al., 2011; wormwiring.org; Figure 1—figure supplement 1). As a control, we imaged the RMG neurons. We first measured spontaneous (Figure 7A,B) and O2-evoked (Figure 7C,D) Ca2+ changes in animals immobilized with 3 mM levamisole; levamisole immobilizes C. elegans by activating nicotinic acetylcholine receptors expressed in body wall muscle (Lewis et al., 1980). As expected (Kawano et al., 2011), Ca2+ levels in AVA and AVB neurons, and in the A and B neurons, were anti-correlated. As observed previously (Schrödel et al., 2013), in unstimulated animals the bouts of activity in which neurons promoting backward movement (the AVA and VA neurons) were more active than neurons promoting forward movement (the AVB and VB neurons) often lasted for more than a minute before switching stochastically (Figure 7A,B). This fictive behavior contrasted with the real behavior of animals moving on an agar plate, which only reverse for a few seconds. 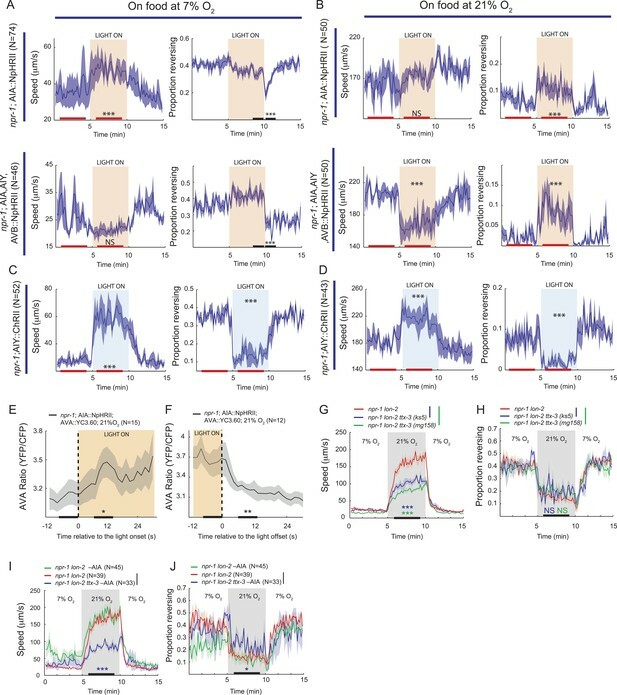 Nevertheless, the fictive behavior evoked by a rise in O2 recapitulated some of the expected response: the backward module (VA neurons) was reliably activated by O2 upsteps from 7% to 21% O2 (Figure 7C). Moreover, when we exposed animals to a graded O2 series of 21–14–7–21%, we found that, despite frequent switches in activity, the average activity in AVB and AIY was modulated by O2 levels, with higher Ca2+ at 21% compared to 7% in both neurons (Figure 7D). Spontaneous and O2-evoked Ca2+ responses in interneurons and motoneurons in immobilized animals. (A and B) Spontaneous bi-stable Ca2+ responses observed in VA and VB neurons (A) and in AVA and AVB neurons (B) in individual npr-1 animals immobilized with 3 mM levamisole and kept at 7% O2. As expected, Ca2+ responses in VAs versus VBs (A) and AVA versus AVB (B) neurons were anti-correlated. Different colored shading and F and B indicate fictive forward (F) or backward (B) movement. (C) On average, an upstep from 7% to 21% O2 evoked a Ca2+ response in the VAs neurons of npr-1 animals immobilized with 3 mM levamisole. (D) Despite stochastic, high amplitude changes in Ca2+ levels of AIY and AVB neurons, on average, higher [O2] correlated with higher Ca2+ levels in AIY and AVB in animals immobilized with 3 mM levamisole. The AVA and AVB interneurons, and their downstream targets the A and B motoneurons, respond to a variety of sensory cues transmitted by upstream circuits to control C. elegans' direction of movement. These upstream circuits include highly connected interneurons called AIA, AIB, and AIY that are post-synaptic to multiple sensory neurons (White et al., 1986; wormwiring.org). We speculated that the highly variable Ca2+ baseline we observed in AVA, AVB, and AIY reflected these diverse inputs, and that modulation by O2 levels acts on top of these other inputs. In levamisole-treated animals, the frequent switches observed in AVA, AVB, and AIY might reflect attempts by the animals to change their direction of movement. To examine this possibility without the caveats associated with levamisole treatment, and in a way that allows us to record information about the animals' behavior, we imaged neural activity in animals moving freely on food under a layer of PDMS, at 7% or 21% O2. Under these conditions, animals modulated their speed of movement in response to O2 levels, although with reduced amplitude, but did not exhibit the high reversal state normally observed at 7% O2, perhaps because of the effects of being under a PDMS layer (Figure 8A; Figure 8—figure supplement 1). Correlation of neural activity and behavior at 7% and 21% O2. (A) Under our Ca2+ imaging conditions, freely moving npr-1 animals increase their speed but do not suppress reversals at 21% O2. (B–G) RMG neurons respond to 21% O2 with a strong persistent increase in Ca2+ regardless of direction of travel (B). 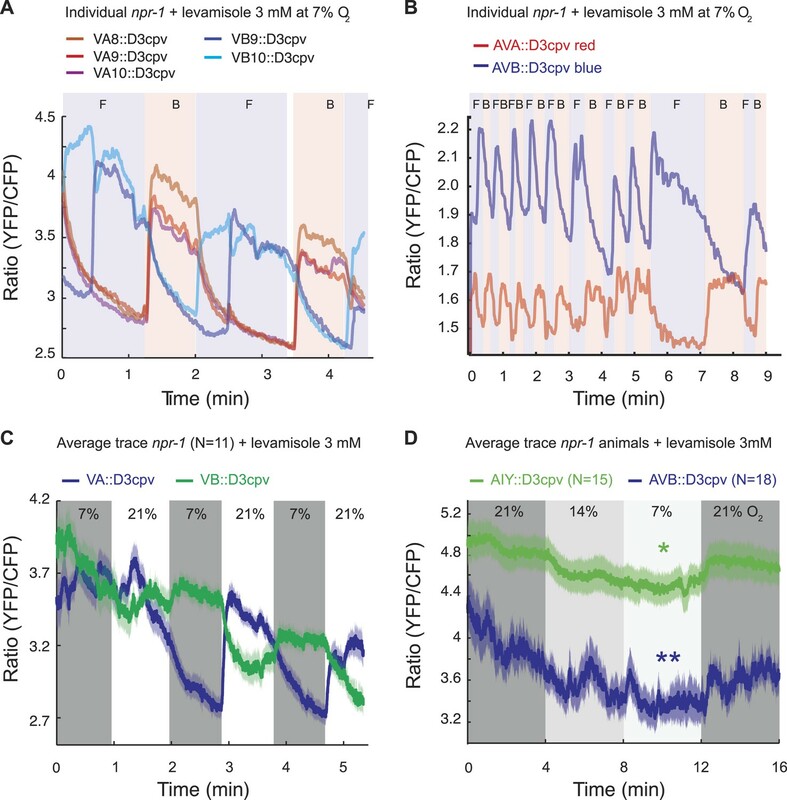 By contrast, freely moving npr-1 animals display frequent brief Ca2+ changes in AIA (C), AIB (D), AVA (E), AVB (F), and AIY neurons (G), at both 7% and 21% O2. Most Ca2+ changes are associated with reversal events. As expected from our imaging of immobilized animals, RMG interneurons responded to a 7–21% increase in O2 with a large tonic rise in Ca2+ that lasted for as long as animals were at 21% O2 (Figure 8B). Ca2+ levels in RMG did not change when animals reversed or stopped moving forward. By contrast, the AVB, AVA, AIY, AIA, and AIB interneurons each displayed frequent, large but brief changes in Ca2+ levels, at both 21% and 7% O2 (Figure 8C–G). Superficially, these Ca2+ changes appeared to occur stochastically, as in immobilized animals, but careful analysis showed that they usually coincided with a switch in the direction of travel, and never lasted more than a few seconds (Figure 8C–G). We hypothesized that the large changes in Ca2+ levels associated with executing reversal behaviors would obscure any smaller Ca2+ changes in these neurons that were evoked by a change in O2 concentration. To examine this possibility, we registered Ca2+ traces to the initiation of a reversal, and averaged responses across multiple animals kept at either 7% or 21% O2. We then compared Ca2+ levels in each neuron as animals executed reversals at 7% or 21% O2 (Figure 9A). As expected, we observed changes in Ca2+ associated with the reversal behavior sequence. Superimposed on this, our analysis revealed that Ca2+ levels in AVB and AIY, but not in AIA, AIB, and AVA neurons, differed significantly between animals kept at 21% and 7% O2 (Figure 9B–F). AVB showed higher Ca2+ levels during forward locomotion at 21% O2 than at 7% O2 (Figure 9B). AIY also showed significantly higher Ca2+ levels at 21% O2 than 7% O2 during forward locomotion (Figure 9C), and only showed changes in activity correlating with reversal behavior at 7% O2. As expected, the RMG interneurons showed strong modulation by O2 but no change in activity correlating with reversal state (Figure 9G). Together, our data predict that modulation of AVB and AIY downstream of RMG mediates behavioral changes induced by different O2 environments. AVB and AIY interneurons integrate information about O2 levels with other input. (A) Animals showed a characteristic pattern of speed changes when traces were aligned according to the time of reversal initiations. (B–G) AVB (B), AIY (C), and RMG neurons (G) show increased Ca2+ at 21% O2 compared to 7% O2 during forward movement. By contrast, average Ca2+ in AIA (D), AIB (E), and AVA (F) was not significantly modulated by O2. (H and I) Normalized Ca2+ traces in AVA, AVB, AIA, and AIB neurons aligned to the first frame of backward locomotion (H), or to the first frame of forward movement (I), during spontaneous reversals. Reversal initiation correlates with a rise in Ca2+ in AIB and AVA and a fall in Ca2+ in AIA and AVB. The converse pattern is observed when reversals are terminated. Our data also suggest a sequence of changes in neural activity associated with the initiation and the termination of reversals at 7% and 21% O2. In particular, we observed a fall in AIA Ca2+ coincident with a rise in AIB Ca2+ that immediately preceded reversal initiations, and was followed by a drop in AVB Ca2+ and a rise in AVA Ca2+ around the time reversals begin (Figure 9H). Termination of reversals was preceded by a fall in AVA Ca2+, and associated with a rise in Ca2+ in AVB and AIA, and a drop in Ca2+ in AIB (Figure 9I). To test for physiological roles of AIY, AVB, and AIA interneurons in O2-evoked changes in behavioral state we turned to optogenetics and ablation experiments. We first expressed halorhodopsin (eNpHR2) in the AIY, AVB, and AIA interneurons, or in AIA alone, in an npr-1 background, and used light to inhibit these neurons. At 7% O2, acute inhibition of AIY, AVB and AIA together, or of AIA alone, only had minor effects on behavior (Figure 10A). When the light was turned off, we observed a transient decrease in the rate of reversals that probably reflected disinhibition of AIA (Figure 10A, compare AIA alone with AIA, AIY, and AVB). AIY and AVB interneurons contribute to the switch in locomotory activity evoked by 21% O2. (A and B) Behavioral effects of inhibiting AIA or AIA, AIY and AVB using halorhodopsin in animals kept at 7% O2 (A) or 21% O2 (B). (C and D) Behavioral effects of activating AIY neurons using channelrhodopsin in animals kept at 7% O2 (C) or 21% O2 (D). (E and F) Ca2+ responses evoked in AVA interneurons by inhibition (E) or disinhibition (F) of AIA neurons using halorhodopsin. (G and H) Disrupting the ttx-3 homeobox transcription factor required to specify AIY cell fate attenuates the rapid movement evoked in npr-1 animals by 21% O2 but not the inhibition of reversals. ttx-3 (ks5) and ttx-3(mg158) are different null alleles. (I and J) Ablating AIA neurons alone does not disrupt responses of npr-1 animals to 21% O2. npr-1 ttx-3 mutants ablated for AIA neurons both move more slowly and reverse more frequently than controls. When animals were kept at 21% O2, acute inhibition of AIA caused a sustained increase in reversal rate compared to control animals, but did not significantly alter their speed of movement (Figure 10B). Inhibition of AIA, AIY and AVB together at 21% O2 caused a sustained decrease in the speed of movement together with an increased rate of reversals compared to control animals (Figure 10B, compare AIA alone with AIA, AIY, and AVB). Together, our data suggest that although we do not observe regulation of AIA Ca2+ by O2 (Figure 9D), tonic AIA activity plays a role in inhibiting reversal rate at 21% O2, while AIY and AVB promote rapid forward movement. Since inhibiting AIA at 21% O2 promoted reversal behavior (and disinhibiting AIA suppressed reversals at 7% O2), we examined how altering AIA activity modulated downstream circuits. We imaged Ca2+ in the AVA interneurons of freely moving npr-1 animals kept at 21% O2 while acutely inhibiting or disinhibiting AIA with light. Inhibiting AIA evoked a rise in AVA Ca2+ (Figure 10E), while disinhibiting AIA caused a rapid fall in AVA Ca2+ (Figure 10F). These results suggest that AIA has inhibitory control of AVA activity, and is consistent with AIA activity preceding AVA activity during spontaneous reversals. We next expressed ChR2 selectively in AIY in an npr-1 background, and used light to activate this interneuron at low and high O2 concentrations (Figure 10C,D). Activating AIY caused a sustained decrease in reversal rate and an increase in speed, both at 7% and 21% O2. Thus, consistent with the predictions made from our Ca2+ imaging experiments, optogenetics suggest that increasing AIY activity can increase the speed of locomotion and decrease reversal frequency. To test further for a role of AIY in the O2-evoked behavioral switch, we examined the O2 responses of npr-1 ttx-3 mutants. ttx-3 encodes a LIM homeodomain transcription factor required for specification of AIY (Hobert et al., 1997). ttx-3 npr-1 animals sped up less than npr-1 animals upon being switched from 7% to 21% O2, but inhibited reversal behavior to a similar extent (Figure 10G,H). Ablating AIA interneurons in ttx-3 npr-1 animals did not alter speed further, but significantly increased reversal rate at 21% O2 (Figure 10I,J). These results are consistent with AIY playing a physiological role in promoting rapid movement at 21% O2, and suggest that AIA acts with AIY to inhibit reversal behavior at 21% O2, although neither neuron appears to be essential. We reverse engineer a neural circuit that controls the global state of C. elegans, enabling the animal to recognize 21% O2 and avoid, escape, and adapt to surface exposure (Figure 11). the URX, AQR, and PQR O2-sensing neurons are tonically stimulated by 21% O2, causing sustained changes in C. elegans behavior, gene expression, and circuit state. The RMG interneurons, connected to URX by gap junctions and reciprocal synapses, are activated by URX and drive an aroused locomotory state that promotes escape from high O2. Stimulating RMG using channelrhodopsin is sufficient to evoke rapid and sustained forward movement in animals kept at 7% O2, even if URX, AQR, and PQR are ablated. However, stimulating RMG does not elicit the transient avoidance responses evoked when C. elegans encounter an increase from 7% to 21% O2. Distinct circuits appear to coordinate the transient and persistent behavioral changes evoked by a rise in O2. A model for the circuits controlling the behavioral switch. The URX O2-sensing neurons and the RMG interneurons tonically encode O2 concentration. These neurons communicate to downstream neurons predominantly through sustained changes in neuropeptide secretion. RMG is connected through gap junctions to sensory neurons that can act as shunts, downregulating RMG neurosecretion when the OCR-2 or TAX-4 cation channels they express are less active. URX–RMG output continuously modulates the activity of downstream neurons, including AIY and AVB, but these neurons also respond to other cues, and their activity at any time point reflects both O2 concentration and the behavior being executed. Increased activity of these neurons promotes rapid forward movement. Other neurons, such as AIA and AVA, participate in the execution of the behavioral state but do not appear to be under tonic control of the URX–RMG circuit. RMG activation switches behavioral state in large part by tonic release of neuropeptides. Neuropeptides are used across a wide phylogenetic spectrum to create, maintain, or amplify neuronal network states (Marder et al., 2014). Multiple downstream neurons show long-lasting activity changes in response to the tonic information from URX, AQR, PQR, and RMG. The AIY and AVB interneurons act downstream of URX–RMG to promote rapid forward movement at 21% O2. Unlike URX and RMG neurons, whose Ca2+ levels tonically report O2 levels, Ca2+ levels in AIY and AVB vary widely and rapidly even when O2 levels are unchanging. On average however, Ca2+ in these neurons is higher at 21% O2 than at 7% O2. Thus, tonic input from O2 circuits modulates but does not set AIY and AVB activity. Rapidly varying Ca2+ levels in AIY and AVB likely reflect the ability of these neurons to respond to inputs from other sensory circuits while receiving tonic signals from the O2-sensing circuit (Figure 11). To delineate long-term changes in the activity of neural populations, we sought simple readouts of neurosecretory activity that do not depend on Ca2+ sensors. Ca2+ imaging approaches, although powerful, are blind to signaling mechanisms that alter synaptic and neurosecretory activity without affecting Ca2+ levels. We were inspired by sporadic reports suggesting a positive correlation between neural activity and neuropeptide gene transcription in the mammalian brain. By studying multiple neuropeptide genes expressed in URX, RMG, and other neurons, we showed that transcription of these genes is positively coupled to the secretory activity of the neurons expressing them. The feedback loop appears to act downstream of Ca2+, and to be linked to neurosecretion itself, since it can be disrupted by expressing tetanus toxin, which inhibits synaptic release by cleaving synaptobrevin. The effects of tetanus toxin on neuropeptide expression recapitulate the effects of manipulating circuit activity by disrupting signaling molecules or by altering O2 levels. If our observations are generalizable, neuropeptide transcriptional reporters provide a way to dissect tonic modulation of secretory activity in neural networks. The ability of RMG interneurons to alter behavioral state according to ambient O2 is inhibited by an NPY/RFamide-like neuropeptide receptor, NPR-1. The npr-1 allele found in the N2 standard C. elegans laboratory strain, npr-1 215V, essentially abolishes RMG-mediated escape responses in feeding animals. Our data suggest npr-1 acts by inhibiting neurosecretion from RMG downstream of Ca2+. First, we do not observe a striking difference in O2-evoked Ca2+ responses in RMG between npr-1 and npr-1 215V animals. Second, whereas ChR2 activation of RMG can induce npr-1 animals kept at 7% O2 to switch to rapid movement, it has little effect on animals encoding the NPR-1 215V receptor, even at 21% O2 when RMG Ca2+ levels are high. Third, transcriptional reporters of neuropeptide genes suggest that NPR-1 215V inhibits neurosecretion from RMG and other neurons. NPR-1 may inhibit synaptic release by altering the balance between Go and Gq signaling in favor of Go. Increasing Gq activity, by disrupting the EAT-16 RGS protein or its binding protein RSBP-1, phenocopies the effects of disrupting npr-1. EAT-16 and RSBP-1 activate the Gq GTPase. RMG lies at the center of an anatomically defined hub-and-spoke network connected by gap junctions that include the ASK, ADL, ASH, and URX sensory neurons (Figure 11). Previous work suggested that the RMG hub redistributes inputs across the spoke sensory neurons through gap junctions to direct behavioral responses (Macosko et al., 2009). The importance of gap junctions in the circuit was inferred from the anatomy and genetic manipulations. Whether RMG could propagate electrical signals or Ca2+ across the network, and if so in which direction, or if gap junctions were rectifying or passive gates was unknown. Our data revise our understanding of how this circuit works, as detailed below. ASK are ‘OFF’ neurons that act analogously to vertebrate photoreceptors, responding to ascaroside pheromones or food stimuli with a decrease in Ca2+ (Macosko et al., 2009; Wakabayashi et al., 2009). ASK neurons were proposed to be a major output of the RMG hub-and-spoke network, inducing rapid movement at 21% O2 and promoting aggregation in response to pheromones (Macosko et al., 2009). In this model, RMG stimulates ASK excitability via gap junctions in aggregating strains, but in solitary strains this is prevented because NPR-1 215V directly or indirectly inhibits gap junctional signaling in the network. 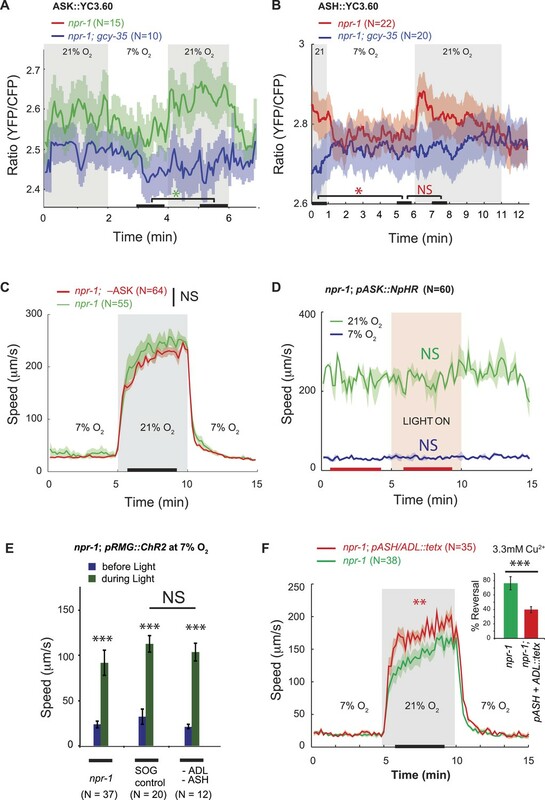 We find that ablating ASK neurons or reducing their activity using halorhodopsin does not disrupt either O2-evoked changes in locomotory activity, or aggregation behavior. These data suggest ASK is not required for either of these responses, although we cannot exclude that it acts redundantly with other neurons to promote these behaviors. The ASK ablation result contrasts with both our own data (Tremain, 2004) and those of others (Macosko et al., 2009). Both these studies show that npr-1 animals defective in the cGMP gated ion channel TAX-4 fail to aggregate or to move rapidly in normoxia, and that these behaviors can be restored by expressing TAX-4 in URX and ASK (Tremain, 2004; Macosko et al., 2009). Why does ablating ASK have different behavioral consequences from disrupting cGMP signaling in this neuron? One possibility is that removing tax-4 reduces the basal excitability of ASK (and other TAX-4-expressing neurons) and shunts current from RMG, compromising its ability to direct O2 responses. However, since tax-4 mutations disrupt many sensory modalities (de Bono and Maricq, 2005), other explanations are also possible. 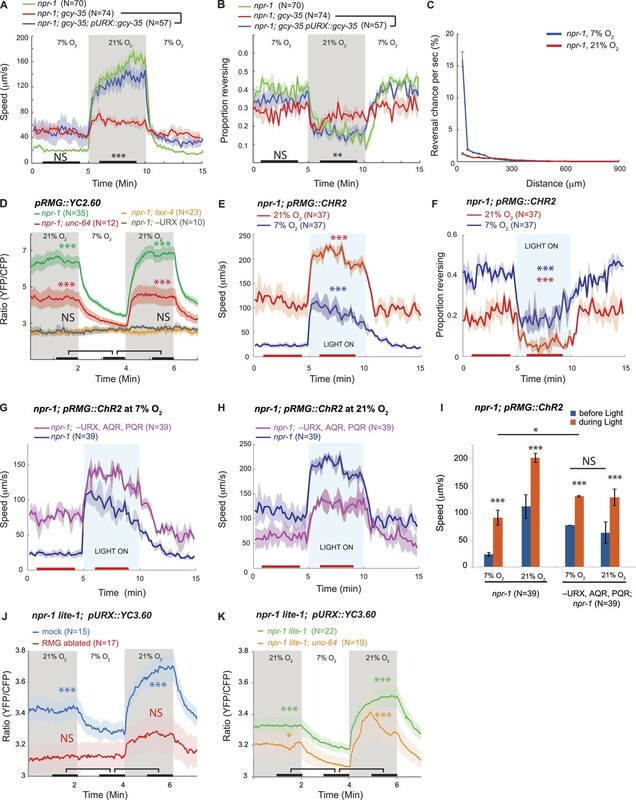 Disrupting the OCR-2 TRPV-like cation channel attenuates the switch in locomotory state evoked in npr-1 animals by 21% O2. Restoring ocr-2 to any one of the ASH, ADL, or ADF neurons restores O2 modulation of locomotion to ocr-2; npr-1 animals. Injecting current in ASH neurons using channelrhodopsin also restores strong modulation of locomotion by O2 to ocr-2; npr-1 mutants, consistent with ocr-2 mutations chronically reducing ASH activity. The neuroanatomy suggests that ASH and ADL are gap-junctionally connected to RMG. Although a rise in O2 evokes an increase in ASH Ca2+, several findings argue against a simple ‘hub-to-spoke’ model in which ASH and ADL spokes are necessary to relay RMG hub activity outwards to evoke behavioral responses. The Ca2+ increase in ASH upon switch to 21% O2 is very small. Ablating ASH and ADL, or expressing tetanus toxin in these neurons, does not disrupt the O2 regulation of locomotion. Moreover, selective expression of ocr-2 in ADF neurons, which are not gap-junctionally connected to RMG, can partially rescue the ocr-2; npr-1 phenotype. Nevertheless, OCR-2 currents in ASH or ADL can influence the O2-evoked changes in locomotion. How? One model is that tonic/chronic OCR-2 channel activity in ASH and ADL keeps these neurons depolarized and limits the current shunted locally from RMG to these neurons. Several observations support this possibility. First, expression of neuropeptide reporters in RMG is downregulated in ocr-2; npr-1 animals to levels found in npr-1 animals kept at 7% O2. This suggests that loss of TRPV activity reduces neurosecretion from RMG. Second, the ability of ocr-2 expression in ASH or ADL neurons to rescue the ocr-2; npr-1 phenotype does not require neurotransmission, suggesting gap junctions are involved. Third, injecting current into ASH can restore to ocr-2; npr-1 animals the O2 regulated switch in high locomotory activity. Fourth, injecting current directly into RMG using channelrhodopsin can also rescue the ocr-2; npr-1 phenotype, indicating that increasing RMG Ca2+ is sufficient to bypass the lack of OCR-2-dependent activity. Unexpectedly, deleting ocr-2 did not affect the steady state O2-evoked Ca2+ responses in the RMG cell body, suggesting that any effects on RMG Ca2+ dynamics are local. The simplest model that explains our data is that OCR-2 signaling in ASH and ADL prevents shunting of current, or loss of a Ca2+-dependent second messenger, from RMG to ASH and ADL through gap junctions. Membrane potential and Ca2+ dynamics are not necessarily coupled, and a local current leak through gap junctions can be functionally important without necessarily altering Ca2+ at the soma. We show that none of the spoke neurons of the RMG ‘hub and spoke’ are individually necessary for RMG to alter the behavioral state in response to changes in O2 in npr-1 animals. This contrasts with the analysis of an anatomically similar circuit that mediates nose touch perception in C. elegans (Chatzigeorgiou and Schafer, 2011). In that circuit, OLQ and CEP mechanoreceptors that are coupled by gap junctions to each other and to the RIH hub interneuron act as coincidence detectors, pooling information through RIH, which in turn enables the high threshold FLP mechanoreceptors, also connected to RIH via gap junctions, to evoke a response to a gentle nose touch. In the RMG circuit, reducing RMG neurosecretory output by cell-selective expression of tetanus toxin or RNAi knockdown of the carboxypeptidase E egl-21 strongly reduces transmission of the high O2 information, suggesting that peptidergic release from RMG is a major output of the URX and RMG couple. Optogenetic experiments coupled with imaging experiments in freely moving animals provide insights into the information carried by different neurons in the O2 circuit. RMG tracks O2 levels, becoming more active at higher O2 levels. Increased RMG activity drives faster forward movement and inhibits short reversals. However, RMG activity does not change when animals slow down or execute a reversal. Thus, RMG provides modulatory input but is not actually part of the circuit executing the behavior. Like RMG, AVB and AIY have, on average, increased Ca2+ at 21% O2. However, unlike RMG, these neurons do not show continuously high Ca2+ levels. Instead, they show switches in Ca2+ levels that correlate with reversal behavior. Most likely, the connectivity within the reversal modules (AIA, AIB, AIY, AIZ, AVA, and AVB) shapes a sequence of neuronal activation triggering/terminating the reversals. Modulation of the AVB and AIY interneurons by O2 acts on top of that patterned activity to control overall locomotory pattern. 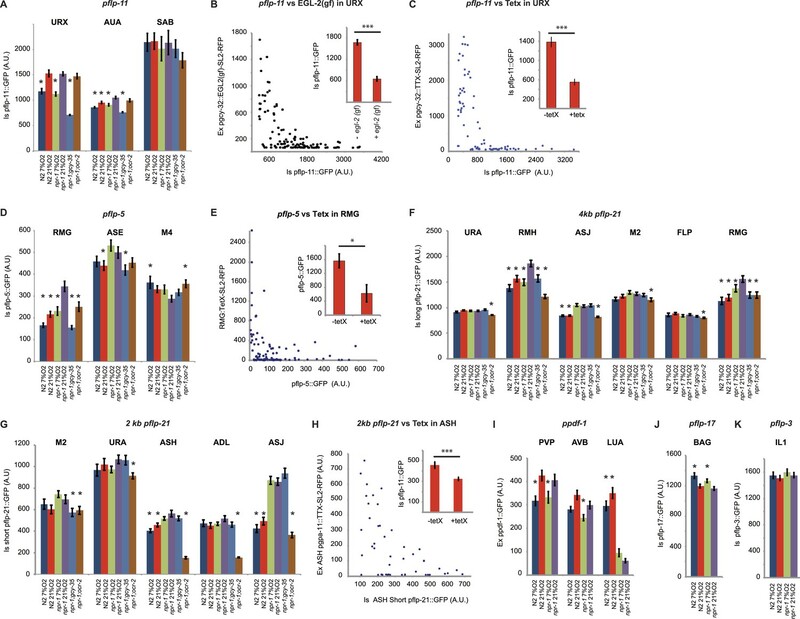 AIA, AIB, and AVA neurons do not appear to be modulated by O2 levels, and are involved in the reversal behavioral sequence irrespective of O2 concentration (Figure 9D–F). For behavioral effectiveness, each module state should enhance a specific behavior while suppressing incompatible behaviors. Our results suggest a direct role for AVB and AIY in both promoting high speed and suppressing reversals at high [O2]. Such functions have been proposed for these neurons in other contexts (Kawano et al., 2011). Interestingly, AIY was also proposed to be involved in the control of lifespan and metabolism, something also modulated by O2 (Shen et al., 2010). Potentially, information about O2 concentration could flow from URX–RMG to AVB and AIY in part through neuropeptide secretion. Persistent changes in behavior and physiology require persistent changes in neural network activity. We identified several layers of neurons that display sustained changes in activity according to ambient O2. However, the logic of the activity of different layers differs. In the O2-sensing neurons, URX, AQR, and PQR, Ca2+ sensors reported O2 levels, as expected (Busch et al., 2012). In the first interneuronal layer, including the RMG hub interneuron and potentially the PVP interneurons, Ca2+ levels also tracked O2 concentration, although these neurons probably relay other information besides O2 concentration, such as activity of the TRPV expressing neurons. Moreover, the activity level of RMG controls behavioral state rather than directly commanding a specific action: RMG activity remains high at 21% O2 regardless of the animal's speed or direction of travel. By contrast, the second and third layers of interneurons modulated by O2 appear to be directly involved in generating specific behaviors. Ca2+ changes in these neurons anticipate or report the animal's behavior. The activity of some but not all of these neurons, including AVB and AIY, is modulated but not set by O2 input. These downstream interneurons are probably not dedicated to a small subset of sensory inputs, as RMG or PVP might be, but instead simultaneously translate multiple streams of information into the appropriate behaviors. Changing RMG activity is sufficient to evoke the behavioral states associated with high and low O2. Downstream of URX–RMG we find widespread modulation of neurons and neuropeptide expression/secretion, highlighting the complexity of even a simple contextual cue, O2. Neuropeptide signaling appears to be key to generating the behavioral switch. Similar to motivated states, organismic states re-organize the salience of different sensory cues and change the physiology of the animal. It is tempting to propose that peptides whose release is modulated by O2 re-organize sensory responses and modify the physiology of C. elegans. Studies of cross-modulation of CO2 avoidance by the O2 circuit support this scenario (Carrillo et al., 2013; Kodama-Namba et al., 2013). A similar example of how activation of a neuron and secretion of its associated peptides can coordinate behavioral and physiological responses is provided by mammalian tonic nociceptive neurons. In addition to amplifying the nociceptive signal in the spinal cord, the release of tachykinin and CGRP peptides from the nociceptive neurons alters gene expression in the surrounding tissues, producing neurogenic inflammation (Carlton, 2014). Behavioral states and emotions are under intense investigation in mammalian systems, but the circuits engaged in implementing these states are only partially mapped. Changes in the global state of mammals are proposed to involve altered activities in multiple brain areas. Here, we outline how a global organismic state is encoded in a system that can be more easily circumscribed and comprehensively dissected. C. elegans was grown under standard conditions unless otherwise indicated (Sulston and Hodgkin, 1988). To cultivate animals in defined O2 environments, we used a Coy O2 control glove box (Coy, Grass Lake, Michigan, USA). Sample preparation: To prevent aggregation behavior, which could confound our comparisons (Andersen et al., 2014), we grew animals at very low density on a thin lawn of Escherichia coli OP50 spread to the edges of a 6 cm petri dish. To obtain a thin lawn, we grew bacteria on NGM containing only 5% of the regular amount of peptone. We picked five gravid hermaphrodites onto the lawn, let them lay eggs for 2–3 hr, and then removed them. The ∼40 eggs were allowed to hatch and grow to adult worms at the indicated O2 concentration. Animals from 10 such plates were rinsed off in M9 buffer and their RNA was extracted using RNeasy Mini Kits (Qiagen, Germany). cDNA libraries were prepared using the TruSeq Stranded mRNA Sample Prep Kit (Illumina) and sequenced on an Illumina HiSeq 2500 platform. We generated independent libraries of biological replicates as follows: npr-1, four libraries for 21% O2 and six for 7% O2; gcy-35; npr-1, seven libraries for 21% O2 and seven for 7% O2. Approximately 30 million 50 bp single-end reads were produced for each sample. RNA-seq data analysis: Reads were output in FASTQ format and their quality assessed using FastQC v0.11.2 (http://www.bioinformatics.babraham.ac.uk/projects/fastqc/). A small portion (3–4%) of reads containing over-represented sequences (e.g., Illumina adapters) identified by FastQC were removed with Trimmomatic v0.30 (Bolger et al., 2014). The remaining reads were aligned to the C. elegans genome (WBcel235) with TopHat v2.0.13 (Kim et al., 2013). TopHat was run using default parameters with the following exceptions: coverage search was disabled using --no-coverage-search; library-type was changed to fr-firststrand; and the WBcel235 transcriptome annotations were provided via --transcriptome-index. In addition, since C. elegans has comparatively short introns (Steijger et al., 2013), --min-intron-length and --min-segment-intron were both reduced to 30. The aligned reads were then processed using the Cufflinks suite v2.2.1 (Trapnell et al., 2012) to assemble transcripts and ultimately compute differential gene expression between conditions. Transcripts were assembled for each sample with the Cufflinks tool (Trapnell et al., 2010), again lowering --min-intron-length, as well as --overlap-radius, to 30. The sample transcript assemblies were then merged with reference annotations (WBcel235) using Cuffmerge to generate a single, overall transcript assembly. The Cuffquant tool, using this merged assembly, was then used to compute gene and transcript abundances for each sample. Finally, sample abundances were integrated with the merged assembly by Cuffdiff (Trapnell et al., 2013) to test for differential expression between all condition pairs. All the Cufflinks tools, aside from Cuffmerge, were used with the --library-type parameter again set to fr-firststrand and both --frag-bias-correct (Roberts et al., 2011) and --multi-read-correct enabled. A gene was considered as differentially expressed between two conditions if the q-value (p-value after Benjamini-Hochberg correction for multiple testing) for the given comparison was <0.05. The gene-level differential expression output from Cuffdiff was used to generate the presented excel files, which were annotated with WormBase IDs (WBcel235) and InterPro domains using custom Perl scripts. DNA cloning was carried out using standard methods (Green and Sambrook, 2012). Promoters used in this work included: gcy-32 (Yu et al., 1997), sra-9 (Troemel et al., 1995), pdf-1 (Barrios et al., 2012), flp-8 (Kim and Li, 2004), flp-21 short (Kim and Li, 2004), flp-21 long (Macosko et al., 2009), gpa-11 (Jansen et al., 1999), srh-220 ADL (F47C12.5) (Troemel et al., 1995), srh-142 ADF (T08G3.3) (Troemel et al., 1995), ins-1 (Tomioka et al., 2006), gcy-28 (Tsunozaki et al., 2008), sra-11 (Troemel et al., 1995), ttx-3 (AIY fragment) (Wenick and Hobert, 2004), and ncs-1 (Macosko et al., 2009). Promoters were cloned into position 1 of the Multisite Gateway system (Invitrogen). Expression clones used in the course of this work are listed in supplemental data. Microfluidic chambers for Ca2+ imaging and behavioral assays were cast as described previously (Busch et al., 2012). For each assay, 20–25 adult hermaphrodites were transferred onto NGM plates seeded 12–14 hr earlier with 40 μl of E. coli OP50. To control O2 levels experienced by the worms, we placed a 200 μm deep square PDMS chamber on top of the agar pad, with inlets connected to a PHD 2000 Infusion syringe pump (Harvard Apparatus) delivering humidified gas mixtures at a flow rate of 2.5 ml/min. We began pumping 5 min prior to the start of the recording to ensure that the initial environment was in a steady state. Movies were recorded using FlyCapture on a Leica M165FC dissecting microscope with a Point Grey Grasshopper camera running at two frames per second. Movies were analyzed using Zentracker, a custom-written Matlab software (available at https://github.com/wormtracker/zentracker). Speed was calculated as instantaneous worm centroid displacement between successive frames. Frames in which the shape of the worm had an eccentricity value (ratio of the two axes of an ellipse with the same second moments) smaller than 0.8 or a compactness value (perimeter2/area) smaller than 30, combined with a solidity value (area/convex hull) greater than 0.575 were identified as omega-turns. To detect reversals, sharp (greater than 60°) changes in direction were first identified. Each potential behavior pattern that could be assigned to each track was then examined using a heuristic algorithm based on penalizing any occurrences of continuous movements lasting for more than 7.5 s in the same direction that do not correspond to forward movements, any time an omega-turn is not followed by forward movement, and cases where a worm does not spend more time in forward than in backward movement. Using this information, directions of movement were determined for each worm in each frame according to the prospective behavioral pattern with the lowest overall penalty score. ChR2 codon-optimized for C. elegans and C-terminally tagged with mCitrine, or halorhodopsin tagged with mCherry, were expressed from the promoters of interest. Worms were grown on plates pre-seeded with 200 μl of the E. coli OP50, with 15 μl of 5 mM all trans-Retinal (Sigma) dissolved in 100% ethanol added to the bacterial lawn prior to picking the worms onto the plates. Control worms were grown in parallel on seeded plates onto which 15 μl of 100% ethanol was added without the all trans-Retinal. Worms were preselected for fluorescence in the neurons of interest, and then assayed as described above. Light stimuli were delivered using a Leica EL6000 mercury lamp filtered for ChR2 or NpHR excitation using a Leica GFP2 or ET DSR filter, respectively. To avoid unwanted light-activation of the optogenetic actuators, we filtered the trans-illumination light using a 595 nm long-pass red optical cast plastic filter (Edmund Optics) for ChR2, and a 705 nm long-pass colored glass filter (Thorlabs) for NpHR. We imaged immobilized animals as described previously (Busch et al., 2012). The experimental setup to image freely moving animals on an agar pad is shown in Figure 8—figure supplement 1. Emission light filtered for CFP and YFP wavelengths (460–495 nm and 525–580 nm, respectively), separated using the Tu-Cam system (Andor) with a 510 nm longpass, was relayed onto two identical Photometrics Cascade II 1024 EMCCD cameras running in frame-transfer modes with 60 ms exposure times. The imaged worm was kept in the field of view by moving the Prior stage manually using a joystick, with the acceleration rate set to its lowest value so as to disturb the worm as little as possible. To reconstruct the speed and trajectory of the worm, the actual stage position was continuously logged while acquiring image stacks using Micromanger (Edelstein et al., 2010) or custom-written software. To deliver gas stimuli to the worm, we placed a square PDMS chamber on top of the agar pad, with inlets connected to a PHD 2000 Infusion syringe pump (Harvard Apparatus) running at a flow rate of 50 μl/s. An electronic valve system placed between the syringes and the PDMS chamber allowed us to switch between two different gas mixtures in a controlled manner at pre-specified frames. Using a spot Optode (PreSens), we monitored the O2 concentration within the chamber while switching between mixtures containing 7% and 21% O2, and found that O2 levels could be switched reliably using this configuration (Figure 8—figure supplement 1). We used Neuron Analyzer, a custom-written Matlab program, to analyze the resulting image stacks (available at https://github.com/neuronanalyser/neuronanalyser). In movies in which the neuron of interest provided the brightest signal in the field of view, we simply tracked the brightest points in each channel. Where this was not a viable option due to the complexity of the expression pattern, we used a semi-supervised heuristic tracking approach in which in each frame the area within a 20-by-20 pixel square centered around the location of the centroid of the region of interest (ROI) in the previous frame was examined for potential matches. Regions whose intensity differed by less than 1/3 from that of the ROI identified in the previous frame, and whose centroids were located within a 10-pixel radius of the ROI location in the previous frame, were identified as candidates for the ROI in the current frame. If no such candidates were detected, user input was requested in identifying the ROI in the current frame. If exactly one such candidate was detected, it was identified as the ROI in the current frame. If more than one such candidate was detected, match quality scores were calculated for each candidate based on their differences in intensity and centroid location from the ROI in the previous frame. If one candidate had a better quality score in both respects than all others, it was identified as the ROI in the current frame; user input was otherwise requested. In cases where the heuristic tracking method struggled to identify the ROI reliably in an automatic way, we used a user-supervised tracking method, in which a custom-sized moveable region was specified using the GUI, restricting the tracking of the brightest point within this regon of interest. Once the centroid of the neuron of interest was identified, we calculated the mean of the 20 brightest pixels within a 10-pixel radius of the centroids for both channels independently, and subtracted from this the median pixel intensity of the respective channels as the background. We then corrected for the crosstalk by subtracting 0.6 from the ratio values. To extract the behavior of the worm during the recording, first a more accurate measure of worm position was obtained based on not only the stage position, but also the location, within the field of view, of a successfully tracked neuron, effectively calculating the position, in stage coordinates, of the centroid of the ROI. The path was then smoothed using a moving average filter, and potential short gaps in the position data were identified, which may reflect the neuron temporarily leaving the field of view due to unexpected worm movements during the recordings. Gaps shorter than 30 frames were then filled using a spline interpolant, while gaps longer than this were excluded from the analysis. In order to identify reversals, the direction of movement, within the coordinate system of the stage, was calculated for each frame using a central differences method, and changes in direction between successive frames were obtained. Intervals in which the worm moved slower than 10 μm/s were flagged as stationary behavior, and were excluded from further analysis. For the remaining frames, the relative changes in direction between successive frames were then examined, and periods containing changes no larger than 7.5° were classified as consistent movement. Consistent movement lasting longer than 90 s was flagged automatically as forward movements. For consistent intervals lasting shorter than this, user input was requested about the direction of the movement. Statistics for both Ca2+ imaging and behavioral assays used the Mann–Whitney U-test. Where we sought to compare steady state values, we chose time intervals where we expected the fluorescence ratios, or behavioral parameters, to have plateaued, that is, with a delay with respect to the timing of the switch in O2 concentration or the presentation of blue or green light. Ca2+ imaging: when presenting time series over the duration of an experiment, n refers to the number of animals imaged. When presenting event-triggered averages (e.g., time relative to the onset of a reversal), n indicates the number of events. In this case, each animal was still only imaged once, but each animal could contribute to multiple events. Behavior: for the intervals of interest, we extracted independent per-subject means deriving from worms flagged as continuously valid for at least 10 s during the interval. A worm was considered valid at a time point if it was not in contact with another animal, it was on the food lawn, and it was located at least half a worm-length from the border. Following these criteria, each worm was sampled at most once per interval; n indicates the minimum number of samples obtained per interval for the two intervals being compared. Current Opinion in Cell Biology 18:365–370. The Journal of Physiology 592:3403–3411. The Journal of Neuroscience 33:9675–9683. The Journal of Neuroscience 5:956–964. Proceedings of the National Academy of Sciences of USA 110:E3301–E3310. Annual Review of Neuroscience 28:451–501. Current Protocols in Molecular Biology, Chapter 14:Unit 14.20. Cold Spring Harbor, New York: Cold Spring Harbor Press. Proceedings of the National Academy of Sciences of USA 72:4061–4065. South African Journal of Science 86:151–152. Canadian Journal of Zoology 68:619–640. Proceedings of the National Academy of Sciences of USA 106:4870–4875. Molecular Biology of the Cell 21:232–243. Proceedings of the National Academy of Sciences of USA 109:7499–7504. The Journal of Experimental Biology 204:1757–1764. Mechanisms of Ageing and Development 131:732–738. The Journal of Biological Chemistry 288:37071–37081. Current Opinion in Neurobiology 23:353–360. WB Wood, editors. ColdSpring Harbor: CSHL Press. MRC Laboratory of Molecular Biology. Cellular and Molecular Neurobiology 10:73–98. Biochimica et Biophysica Acta 1790:765–769. The Journal of Neuroscience 19:9831–9840. Philosophical Transactions of the Royal Society of London Series B:, Biological Sciences 275:327–348. Philosophical Transactions of the Royal Society of London Series B: Biological Sciences 314:1–340. Proceedings of the National Academy of Sciences of USA 94:3384–3387. Thank you for sending your work entitled “Decoding a neural circuit controlling global animal state in C. elegans” for consideration at eLife. Your article has been favorably evaluated by Catherine Dulac (Senior editor), Graeme Davis (Reviewing editor), and 2 reviewers (Scott Emmons and L René García), both of whom are expert in the research area of the manuscript. Laurent et al. are reverse engineering circuit function in C. elegans. The circuit they are studying is one that results in multiple behavioral and physiological changes in response to elevated oxygen levels. Laurent et al. use the full range of experimental tools available in C. elegans, including cell ablation, Ca2+ imaging, optogenetic stimulation, cell-specific expression of transgenes to block chemical transmission and neuropeptide transmission or the cell-specific rescue of such functions in mutants, and automated behavioral analysis. They show that they can identify several layers of neurons in the pathway. Overall the data are convincing and clearly presented in the figures. Both reviewers consider the topic interesting and consider the data well presented and supportive of your major conclusions. As you will see from the comments, both reviewers recommend significant re-writing of the text to make the manuscript accessible to the general audience of eLife. Both reviewers list a series of suggestions that you can use as a guide to improve accessibility of your text. 1) The authors should choose one way to refer to npr-1 “mutants.” This can be very confusing because the N2 allele is itself a “mutant.” The authors refer to the null allele in various places as npr-1, npr-1 mutant, npr-1 loss of function, npr-1(null), npr-1(ad609), and npr-1(ky13). As ky13 is specifically referred to as a null, what is ad609? In the second sentence of the Results they already refer to “npr-1 mutants.” They should explain that by this they mean a null mutation (is that right?). They should specify how they intend to refer to the null allele, and then stick to that one form throughout the paper (except where they want to specifically indicate ad609 vs ky13). 2) The first section of results on changes in gene expression is very confusing and needs rewriting for clarity. URX, AQR, and PQR neurons control “part, but not all, of this response.” What part? Where is the clear statement of the number of genes that change their expression between 7% and 21% O2 in gcy-36(+) but not gcy-36(–)? Figure 1 does not show this and therefore does not show what it says it does in its heading. It shows genes that change between gcy-36(+) vs gcy-36(–) at a single O2 concentration (21%). 3) Start the third section of Results by saying: “Among the three O2 sensing neurons, the URX neurons uniquely make gap junctions and reciprocal synaptic connections with the RMG interneurons.” Since in the forgoing URX has always been mentioned as one of a group of three sensory neurons, along with AQR and PQR, the reader makes a wrong assumption and puzzles, why doesn't RMG respond to AQR and PQR when URX is ablated? 4) For all their references to neural connectivity in the C. elegans wiring diagram, the authors should not only refer to the canonical White et al., paper but also to the data on the WormWiring.org website. The Emmons laboratory has reevaluated the original electron micrographs and has found some discrepancies. 5) The authors show that stimulating RMG can induce the high O2 behavioral response, so its activity is sufficient. But is it necessary? Where is the RMG ablation result? Has this been published already? Yes, I see, it is in Busch et al., Nature Neuroscience, 2012. This should be referred to, as well as their earlier data that the other two O2 sensing neurons signal via peptides to a different target. It would be helpful to make clear that the present paper focuses exclusively on the URX-RMG pathway. 1) The meat of the study begins with Figure 2. As a reader that is not intimately acquainted with the O2-sensing circuitry, I found it helpful to draw out the circuitry and include where ocr-2, npr-1, tax-2, flip-11, etc. were expressed. As I was going through each of the experiments, I referred to my drawing to get my bearings on which part of the circuitry the authors were probing. I suggest that the authors provide a similar circuit roadmap as supplementary figure, to provide a reference for the reader to follow throughout the paper. 2) Beginning in Figure 2, as well as in the other figures, I was not sure what N refers to. For example in Figure 2B, I did not know if N referred to the number of animals? Or Did N refer to number of times that a 7%-21%-7% train was conducted on a limited number of animals, (if so how many animals?). This could be elaborated in the figure legend. Also in Figure 3A, 3B, 3C, 3D, and elsewhere, what does N> (some number) mean? The graphs have SEMs, so there must be a discreet sample size. 3) In Figure D, E and F, (as well as in later experiments), the animals are not reported to contain the lite-1 mutation, but in Figure 2J and 2K, the strains did contain lite-1; is this just a typo? On the scopes in my lab, the 430 to 480 nM light will elicit an escape response in the worm (unless they are lite-1), if the light is too intense. You might want to mention in your Material and methods how you were able get around this. I noticed in Figure 5I and 5J (no retinal) that the light source on your set-up did not irritate the animals, so you might want to mention that early on. 4) You should clarify in the Material and methods what criteria you chose to pick the intervals (black bars and red bars) that you did your statistics. 5) In the subsection headed “ASK, ASH and ADL sensory neuron which have gap junctions with RMG are not required for the O2-evoked switch in behavioral state”, I was not sure whether the punchline was that these 3 neurons were not relevant for O2 sensation, or that these 3 neurons were redundant with each other for O2-responses. The latter seemed to be the case given the following section on ocr-2 mutant phenotype, but stronger wording should clarify things. 6) In the subsection headed “Homeostatic re-setting of downstream O2 responsive circuits according to input”, the first sentence, “… alters circuitry by a homeostatic mechanism, such as…”: the use of the word homeostatic was not clear to me. My imagination (after pondering this for minutes upon minutes) started to come up with wild ideas of acclimation and desensitization after prolonged stimulation, with the ultimate equilibration to a default behavioral state. Then my imagination wanted to know what is that default behavioral state, and this distracting thinking is not what your paper is about. If I interpret your paper's point correctly, it is about how the regulation of immediate locomotor transitions are realized in a physical set of cell connections. So again, maybe more elaboration and keeping the reader's train-of-thought from digressing can help this section. 7) In the subsection “TRPV channel activity alters O2 circuit function upstream of NPR-1”, the last sentence of the first paragraph (“Instead, we suggest that TRPV dependent currents in ASH…”) needs more elaboration; there is more than one concept being stated in this sentence. This sentence puzzled me, and I am guessing (and probably wrongly), that the authors are suggesting that the ASH and ADL have the potential to leach away some excitatory factor from RMG via gap junctions; however, OCR-2 in ASH and ADL can attenuate this? Anyway clarification should make their concepts more obvious. Similarly, three sentences later, the statement, “as the tetanus toxin experiments suggested…”, also contained multiple concepts. This sentence also took me awhile to digest. Again more clarification should make this section easier to understand, and help put the next section in more context. We agree that the nomenclature is confusing. The npr-1(ad609) behaves genetically like a null mutant. We have followed our reviewer’s advice: we state that we study npr-1(null) mutants and that we refer to these as “npr-1” throughout. We have re-written this section entirely, and hope it is now clearer. We agreed with our reviewer that comparing gene expression in gcy-35; npr-1 animals grown at both 21% and 7% O2 was a highly desirable control. As we had not analyzed gcy-35; npr-1 expression at 7% O2 in our original microarray experiment, we repeated our study, this time using RNA sequencing, and included this condition. Briefly, in our revised manuscript we use RNA Seq to compare gene expression of young adult npr-1 and gcy-35; npr-1 animals grown at 7% and 21% O2. In repeating the experiment we also took the opportunity to grow animals at very low density under conditions where we could see no aggregation. In this way we minimized changes in gene expression that are a consequence of aggregation behavior (see Andersen et al., 2014). We have made this change. We agree it clarifies the text. We have added references to WormWiring.org throughout the manuscript. We have made these changes. We thank our reviewer for this useful suggestion. We have added a cartoon of the circuit in Figure 1—figure supplement 1. To keep the paper more manageable we have also removed Figure 1 and presented our gene expression data only in Supplementary data. For behavioral experiments, n refers to the number of independent worms in the time interval for which the statistic was calculated. The > sign (instead of an = sign) is to indicate that there are more worms on the plate than considered for the purposes of statistics. This is because some animals leave the field of view over the course of an experiment. Therefore, when comparing two intervals, one time point may have a smaller n-number than the other. In such situations we report the smaller n-number. In our revised manuscript we have explained this in the Methods, but removed the > sign as it confuses rather than illuminates. For Ca2+ imaging each animal was imaged once, and n refers to the total number of animals studied. The exception is when we show event-triggered averages (e.g. time relative to reversal onset), in which case n refers to the number of events. In this case each animal was still only imaged once, but each animal could contribute to multiple events. We say this in a section of our Methods dedicated to statistics. We now say that by using low light intensities we could evoke ChR2-dependent behavioral responses without irritating animals. Note that for most of our optogenetic experiments we used lower levels of blue light to activate ChR2 than used in most published work. Done. For Ca2+ imaging we say: “As much as possible, we chose time intervals for statistical comparison when fluorescence ratios had stabilized. For behavioral experiments we avoid time intervals close to when we switch O2 concentration”. We have changed the wording to clarify this. However, as we have not ablated ASK, ASH and ADL together, we cannot explicitly state whether all three neurons are dispensable or not. We debated whether to take this section out or to keep it. On the one hand, keeping it allows us to explain why the speed of mutants kept at 7% O2 is higher than that of controls, an observation that initially puzzled us. On the other hand, as our reviewer highlighted, it distracts from our main message. Given the length of the paper we decided to remove it. We agree these sentences are complex. We have tried to simplify them. We thank Dr Yuichi Iino, Dr Chris Li, Dr P Sengupta, Dr R Shingai, the C. elegans Knockout Consortium, the National BioResource Project (Japan) and the Caenorhabditis Genetics Centre for strains, and de Bono and Schafer lab members for comments and advice. We are grateful to James Hadfield and Michelle Pugh at the Cambridge Institute Genomics Core for the RNA sequencing. ZS was supported by a Studentship from the Medical Research Council. MdB acknowledges support from the European Research Council (Advanced ERC Grant 269058). © 2015, Laurent et al.